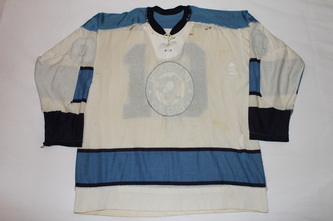 This jersey is quite possibly the most significant game worn jersey in Penguins franchise history, and it's somewhat of a miracle that it survives today. 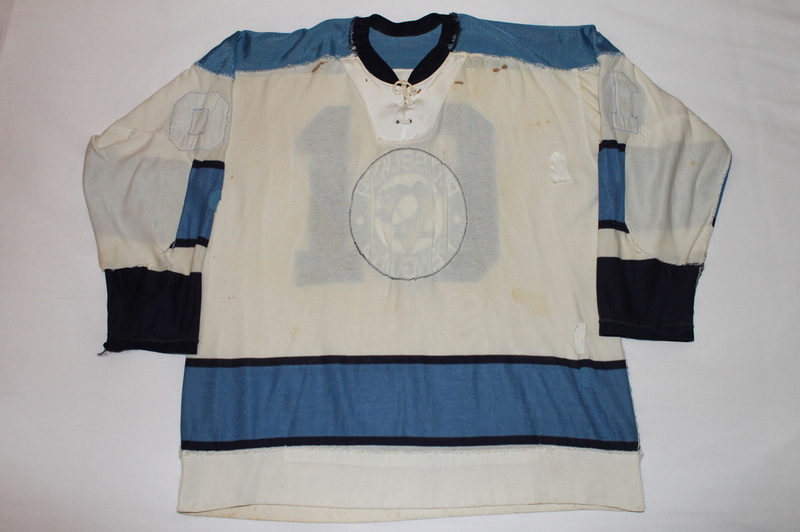 It is the very first jersey ever to be issued by the Penguins, home jersey #1 which was issued to and worn by former AHL Pittsburgh Hornets veteran goaltender Hank Bassen in the very first Pittsburgh Penguins NHL game. 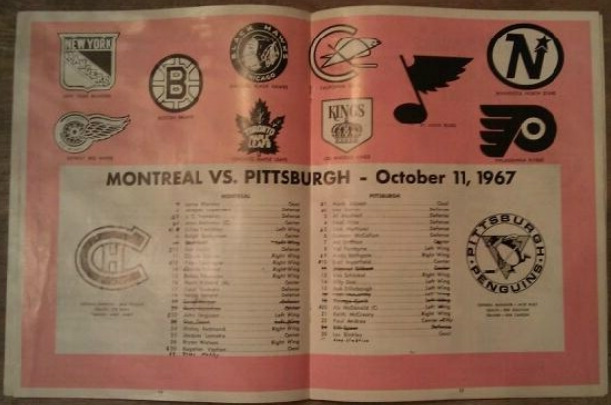 The game was held on the night of Wednesday October 11th, 1967 and the Pens played host to the Montreal Canadiens who were victorious by a score of 2-1. 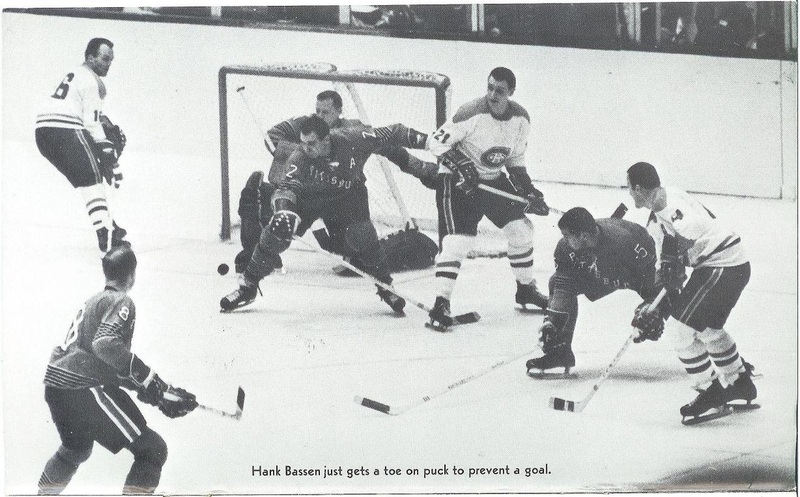 Hank Bassen had the misfortune of giving up the game winning goal to Jean Beliveau, a tally that would mark his 400th career NHL goal. 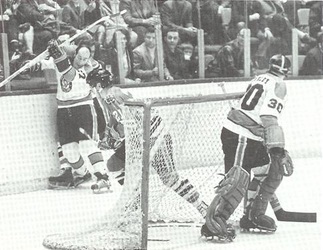 Andy Bathgate scored the first goal of the game, and only Penguins goal which would be the first in franchise history. 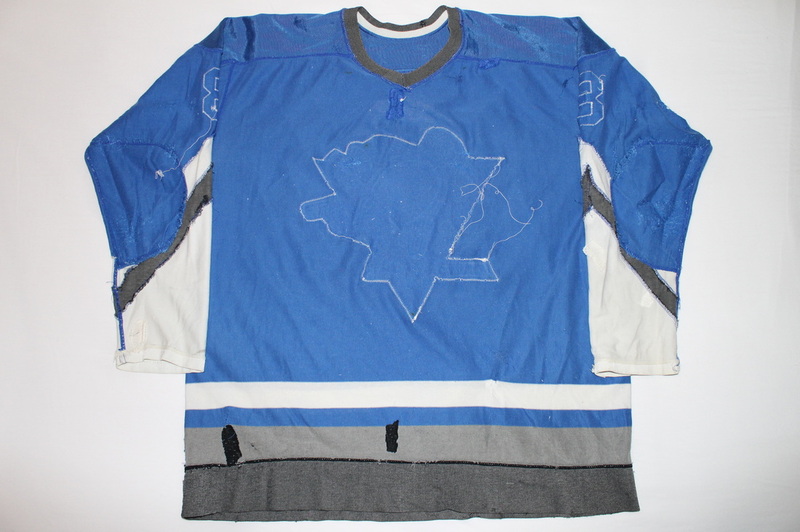 Perhaps as fascinating as the milestone game in which this jersey made it's debut, is the story of it's provenance for the past 40+ years, and ultimately how it survives today. 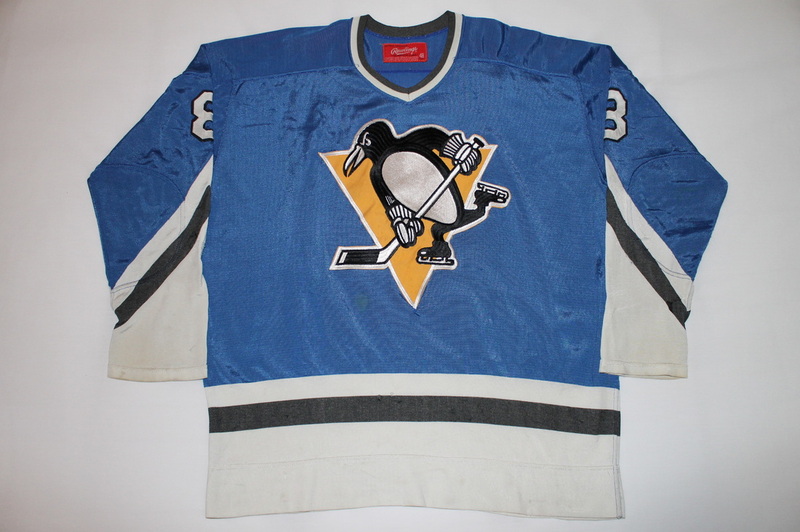 It was long assumed among the game worn collecting community that the home blue set of Penguins inaugural season jerseys were lost to either careless storage or that they had simply been thrown away. 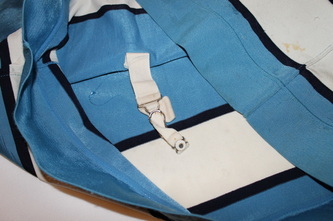 A rumor had circulated for years that made mention of a bag of early Pens gamers having been found tucked away somewhere in the Civic Arena and that they had been put away while damp or sweaty and had so much mold and mildew on them that they were simply thrown away with no thought of their someday historical significance. 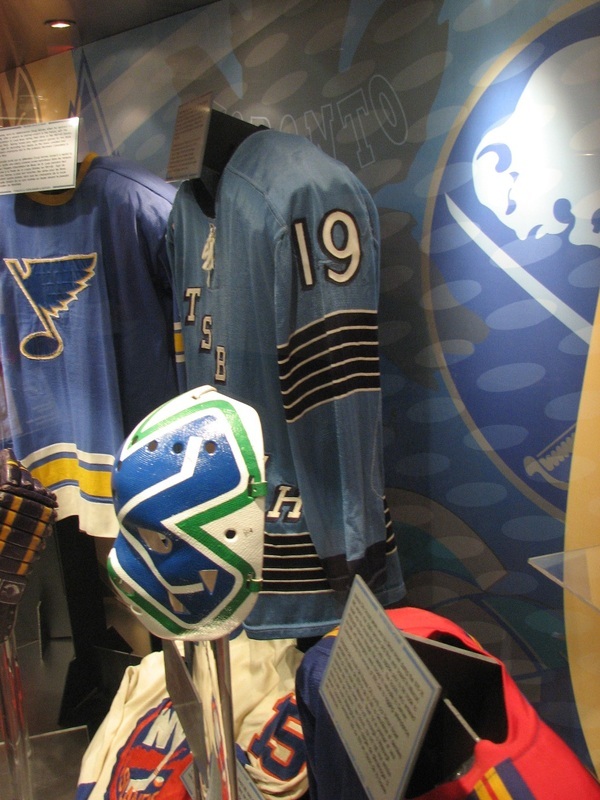 The extreme rarity of the home blue inaugural season jersey seemed to support the legend, with only one known example to exist residing in Toronto's Hockey Hall of Fame, where it sits enshrouded in a glass display case as it has for many many years. A few years back, astute Penguins collector Vince Dioguardi was able to cast doubt onto the "thrown away" theory as he located a series of photos in the 1972 Pittsburgh Penguins annual yearbook which shows action from a University of Pittsburgh game with players dressed in dark P-I-T-T-S-B-U-R-G-H diagonal jerseys that are obvious hand-me-downs from the Penguins' 67-68 season. 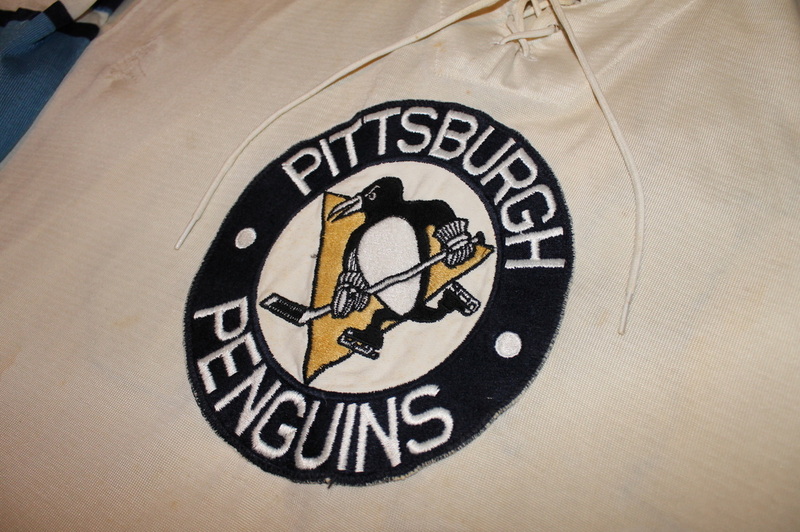 It was not uncommon for pro clubs to support amateur and college clubs at that time, so it makes perfect sense that the Pens would have simply donated their jerseys to the University of Pittsburgh sometime following the 67-68 season where they were apparently recycled for several seasons. 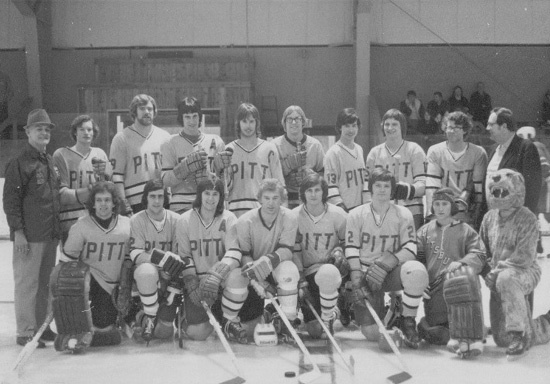 A University of Pittsburgh team photo from an early 70s yearbook concretely confirms the notion the jerseys were used for a number of years as only the goaltender appears in the photo in this recycled Penguins jersey while all other players have PITT block lettered jerseys. 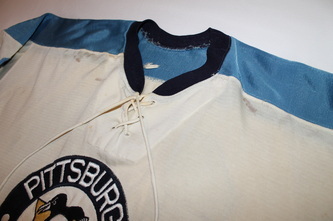 This particular jersey comes from a former University of Pittsburgh goaltender who has owned the shirt since his time with the team in the early 1970s, giving creedence to it's hand-me-down heritage and helping to explain the significant wear on this one. 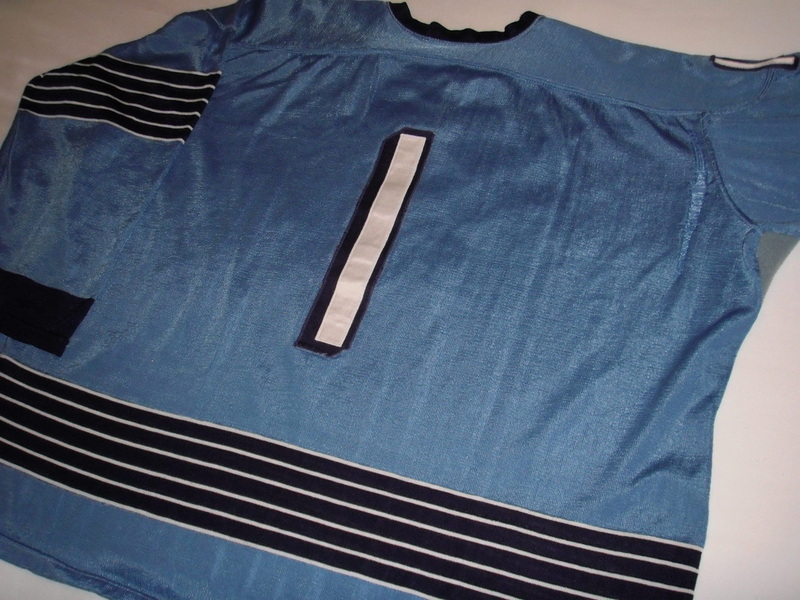 I believe it to be this actual jersey you see on the back of the Pitt goalie in the team photo below. 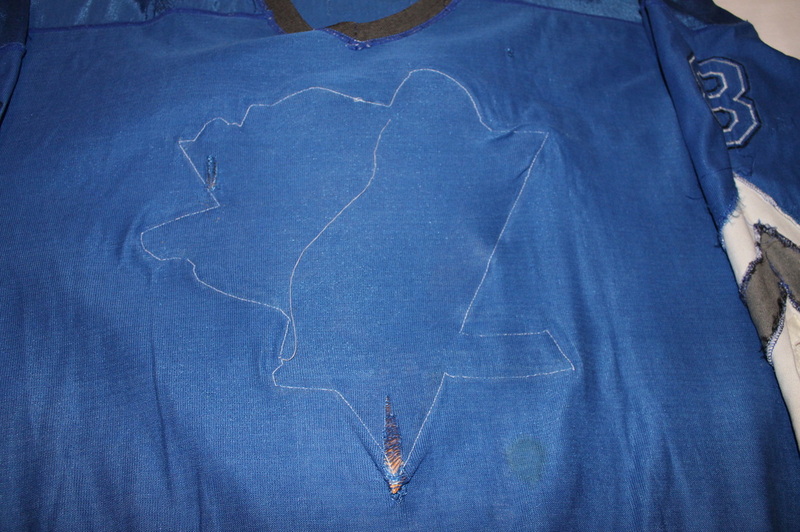 I am very fortunate that the history of this particular shirt has been photo documented, even if it occurred somewhat inadvertently. 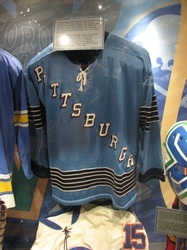 It was in his spectating the 2011 Winter Classic and the new 1967 inspired jerseys that made the owner recall having worn a similar style in college as the Pens had reintroduced for the special game. 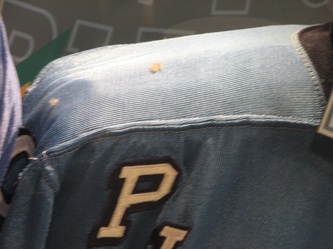 He did some digging and was able to locate the jersey that had been safely and very wisely tucked away since his college days at Pitt. 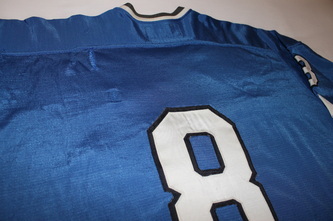 A friend of a friend knew the owner and mentioned the jersey to me which ultimately led to my having the opportunity to purchase it in a cash + 4 jersey deal. Needless to say I acted quickly on this one as the chance to bring home a piece of history like this doesn't occur often. 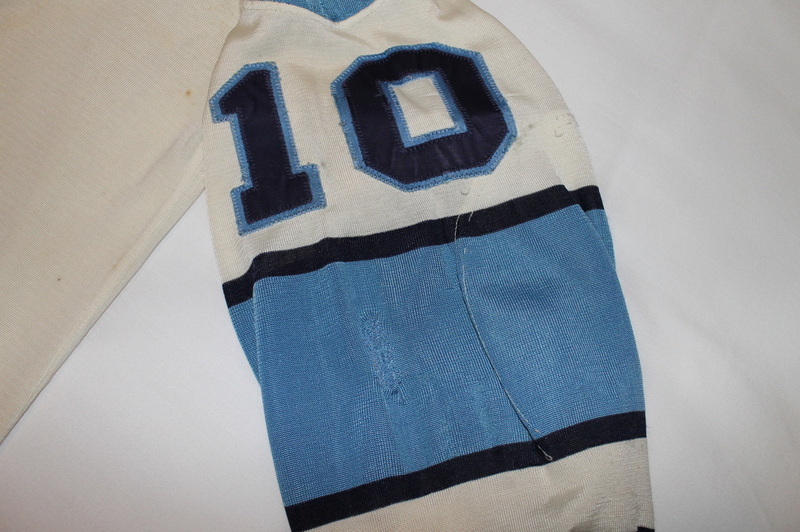 It's a legitimate Hockey Hall of Fame quality piece and I feel truly lucky to have had such a significant piece of Penguins history come into my possession. 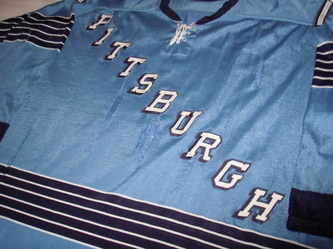 I proudly display it on this site and at local expos as part of the Steel City Gamers collection. 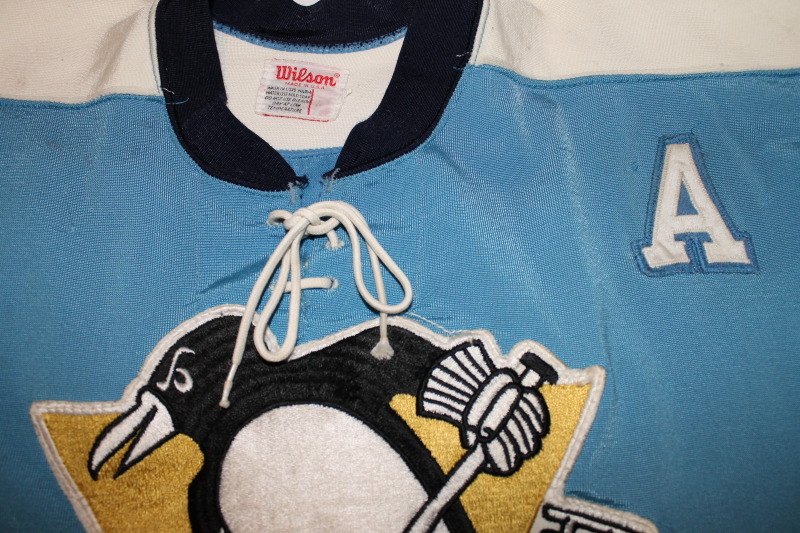 It is truly the starting and ending point for all things Penguins game worn in my opinion. I consider it to be my ultimate chase item, the "white whale" or "holy grail" as some collectors like to refer. I don't expect to see another one anytime soon, but it's the idea that pieces like these are still in existence that keeps me searching for the next one. 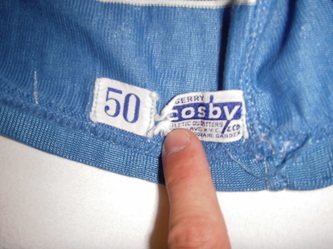 The silky soft durene jersey has Cosby tagging in the hem, size 50 tagging, and remnants of the '67 date tag having been attached originally. It is well worn and has several significant pulls/runners almost, which is common on well worn Cosby durenes. It displays with an aura only appreciated by those who truly understand it's rarity and significance. Well worn yet still possessing that fantastic shimmer that vintage durene gamers are known for. There is just no substitute or modern equivalent to this jersey or material. 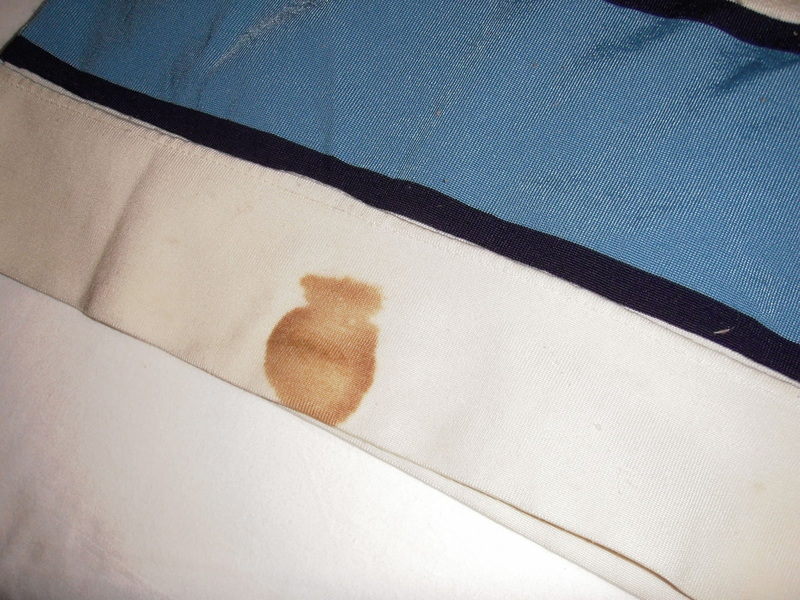 It's almost as smooth as silk. 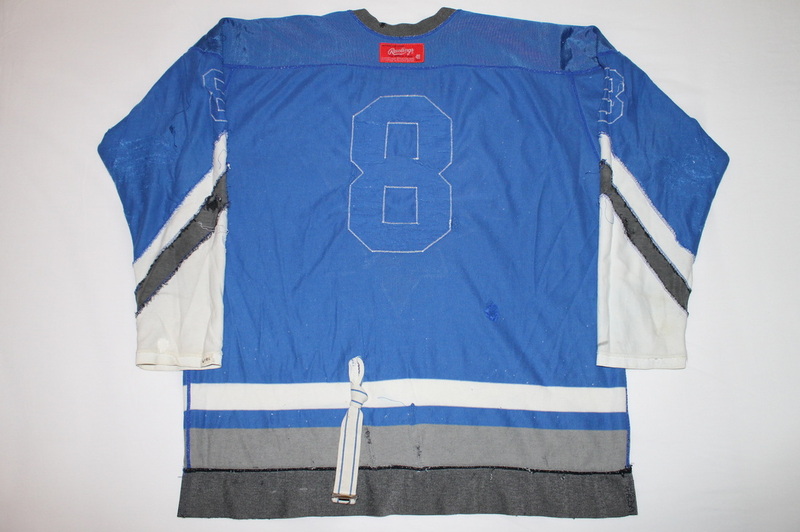 It's as beautiful today as it was in 1967, and in my opinion it's simple style and design have aged like the fine wine in Mario's cellar, except no one had the foresight to carefully preserve any of these, making this quite possibly the only existing example remaining outside of the Hockey Hall of Fame. 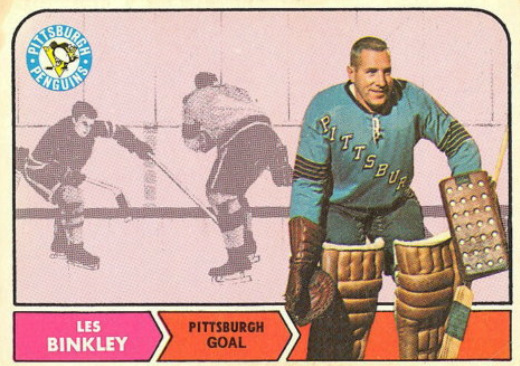 Interestingly enough, the Penguins' starting goaltender Les Binkley wore the home blue #1 jersey for multiple hockey card photos, including his 68-69 O-Pee-Chee rookie pictured above, as well as this 69-70 Topps American version at left. 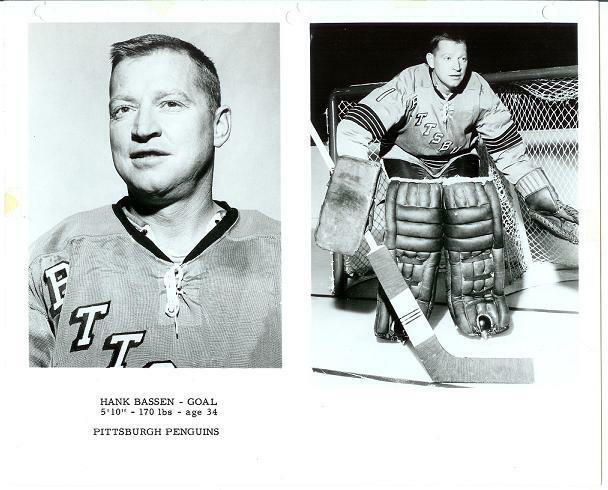 This leads me to believe the photos were likely shot before the Pens even played their first game, and the #1 jersey was a large size 50 goalie shirt which would fit over Binkley's equipment and was therefore used for the first pics taken of Binkley in a Penguins uniform, perhaps before he was even assigned his trademark #30. 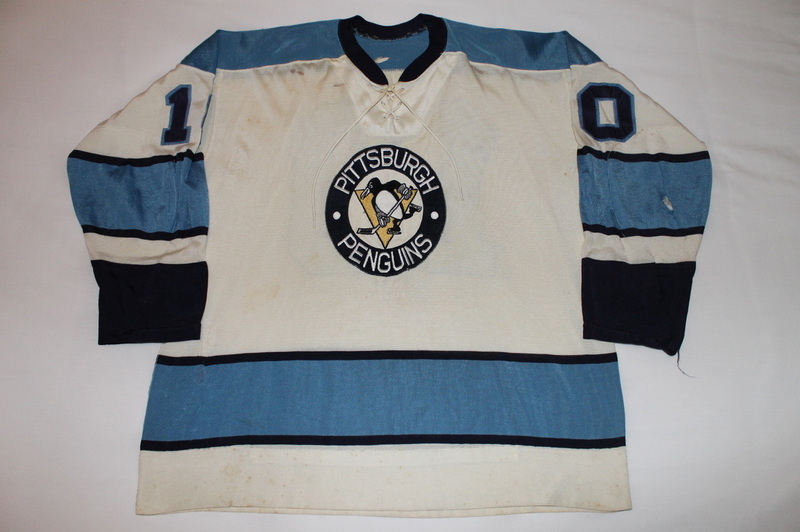 It's cool to know this jersey has been around since the very beginning of the Penguins organization, very fitting...it's #1. This magnificent vintage jersey is from the Penguins' second season in the league and the first in which a skating penguin crest adorned their game jerseys. The jersey is #10 and was worn by team captain Earl Ingarfield as well as George Swarbrick. 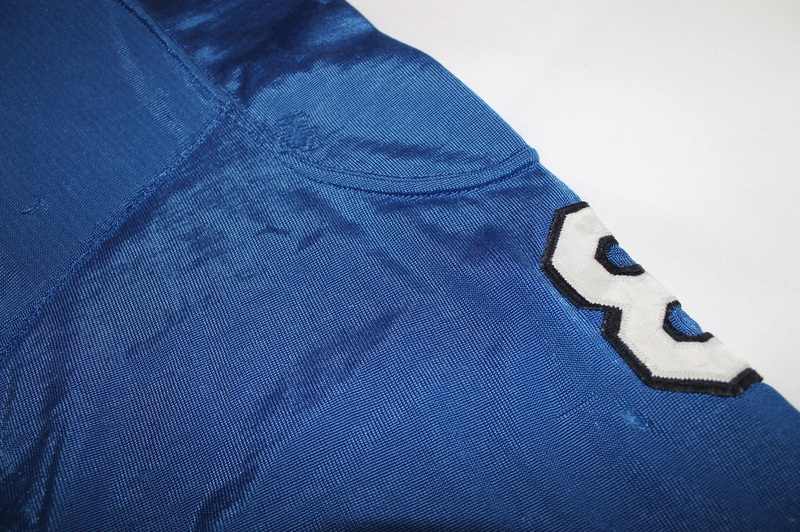 All original crest and numbering remain intact on this outstanding vintage shirt. 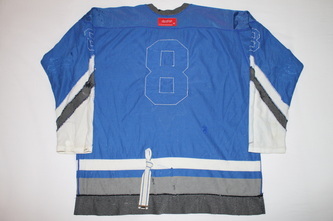 The Captain's C has obviously been removed as it was not necessary when Swarbrick wore the jersey. The shirt remains intact as an excellent example from the team's early days. Many sewn repairs are present, most of which are fabric backed. 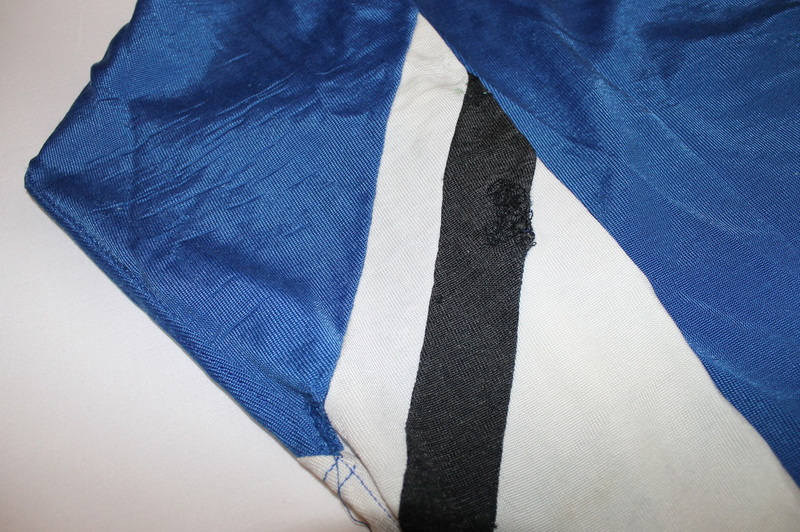 This one also appears to have a custom team alteration made to the hem. 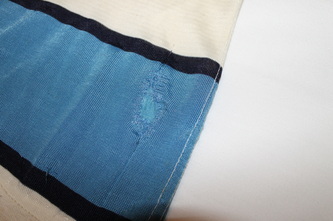 It is interesting to note that some of the repairs are backed with a silky lightweight mesh material, which might catch some as rather strange when the Pens used durene fabric and not mesh during this era. 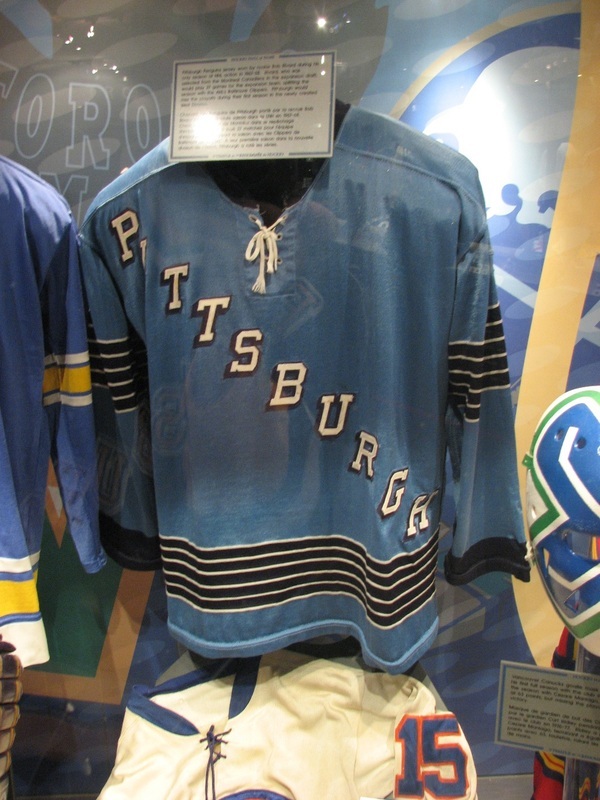 Further investigation has led to photo evidence that the Pens did indeed wear lightweight mesh practice jerseys during this era with a simple silkscreened "Pittsburgh Hockey Club" across the chest. 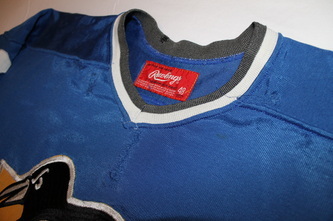 It can be assumed that some of that mesh fabric was used in repairing and maintaining durene game jerseys of the era as well. There are even a few blood stains present on this one adding to it's old time hockey appeal. 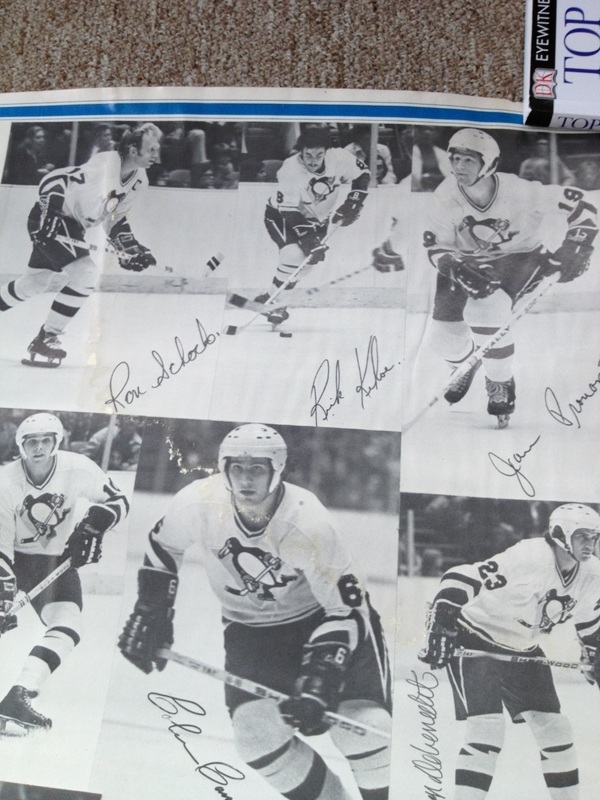 An outstanding and significant piece of Penguins hockey history that is well appreciated and right at home here for sure. Two layer twill numbering is sewn on to the sleeves and back. Many broken stitches and much softening from repeated washings is evident. 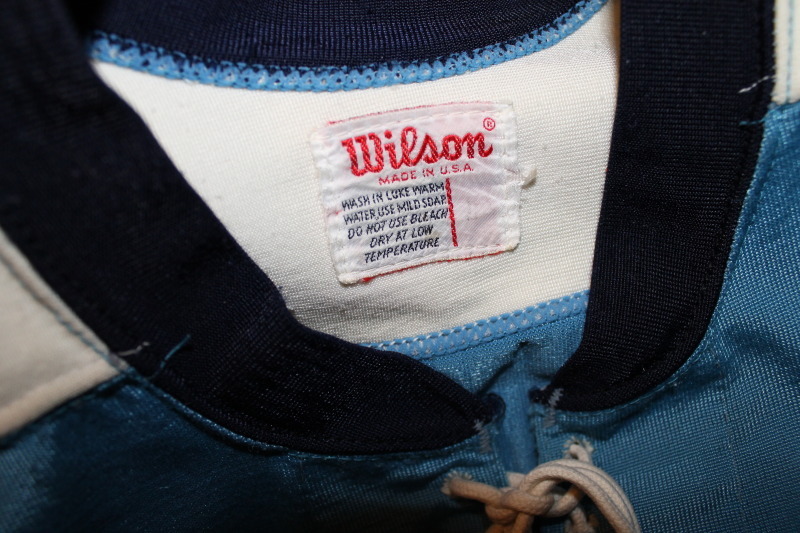 The jersey overall has a very silk feel in the hands, unlike the heavier weight durene of Wilson and Rawlings manufacturers. The General Athletic tagging has become dilapidated and detached over the years but evidence of it's attachment in both the collar and inner hem remain. 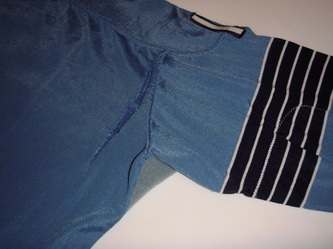 The jersey still has excellent durene shine and presents very well, measuring 25" from underarm to underarm suggesting a size 50. 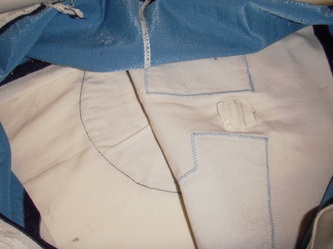 It is a milky antique white in color and immediately shows it's age to anyone who knows what they are looking at. A true piece of Penguins history that was worn by a former team Captain. Originally acquired at a Pens team equipment sale that was held in the basement of the Igloo in the early '70s. It's been in the hands of the original purchaser until recently when I was afforded the opportunity to purchase it to be included in the Steel City Gamers collection. I am happy to add this second season shirt to my collection, particularly because of the exceptional wear and repairs it shows, in addition to it's undeniable eye appeal. 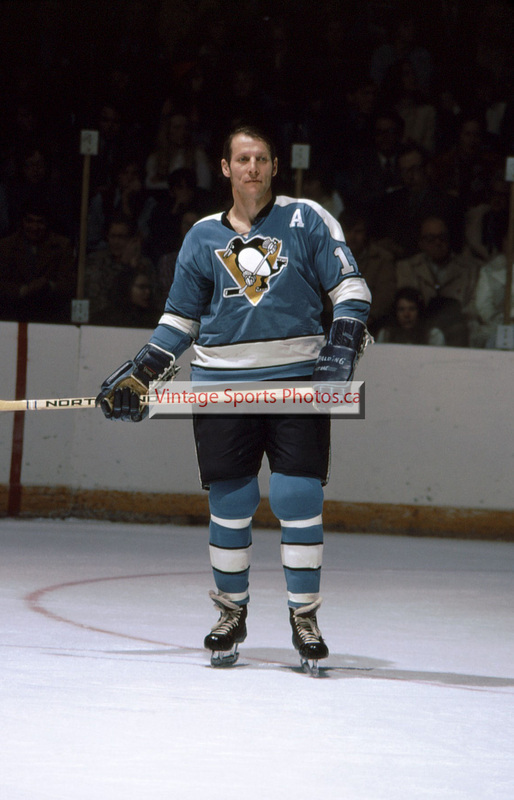 Also interesting to note, is the fact that Earl Ingarfield was the Penguins' first selection in the 1967 expansion draft. 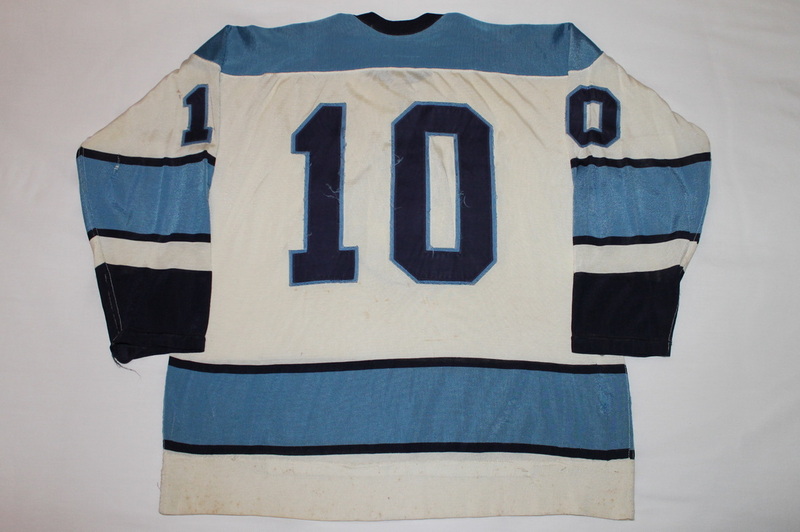 He was selected for his years of professional experience and would later be paired with his ex-NYR linemate Andy Bathgate adding offense to the young squad on the ice while bringing veteran leadership to the dressing room. 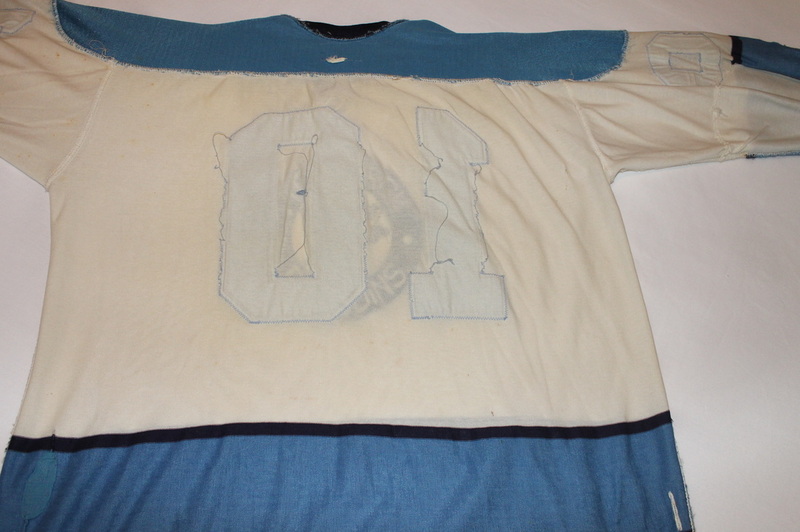 This Wilson durene jersey was worn by defenseman Jim Morrison during the 70-71 season. It features the original circle crest, necklace, and all original unaltered numbering. Well worn with several sewn repairs and significant blood staining, sized 46 with the original Pittsburgh Sport Shop customizer tagging intact in the collar. 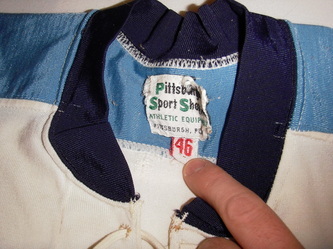 The size 46 flag tag is actually taken from the original Wilson manufacturer's tagging and was reused by the Pittsburgh Sport Shop. Not something you'd notice unless you are familiar with Wilson tagging. 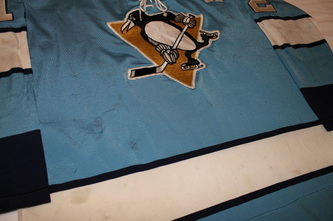 A great looking old jersey and a well preserved example of an early Pens durene. 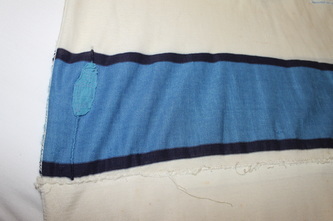 Purchased from a private collector who had owned it since the 70s. 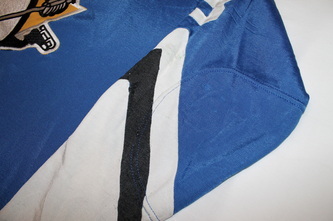 Evidence of the TV nameplate having been on and off exist in the form of team repairs to the rear shoulder area. Staining on the rear hem appears to be dried blood. Overall an excellent example of a Penguins gamer of this era. 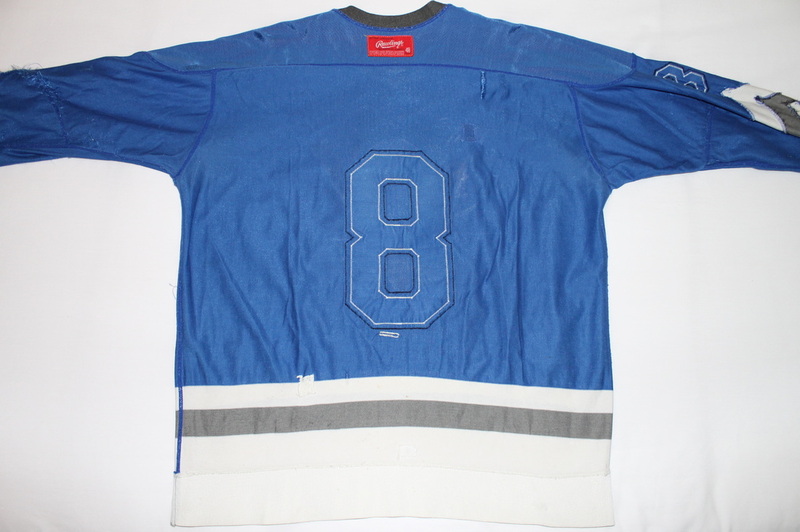 Thsi jersey comes via Classic Auctions. 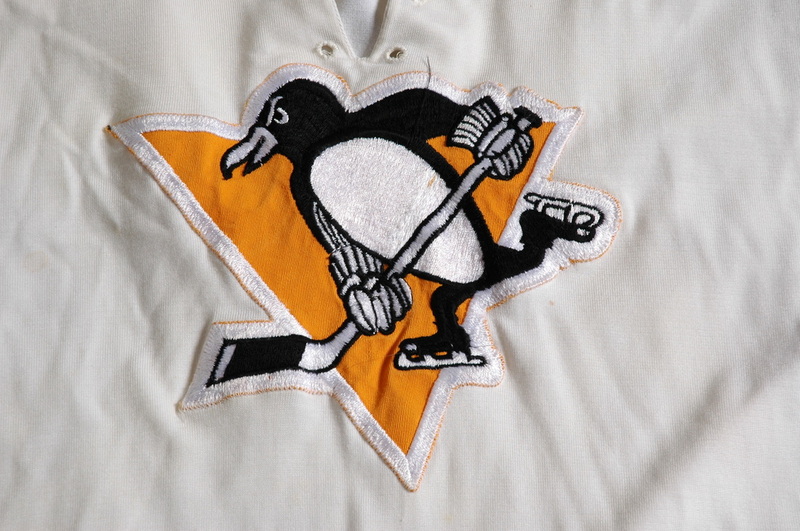 An incredible rarity in white, as these jerseys were handed down to the Junior Penguins amateur team for further use after being retired by the NHL Penguins organization. This one survives, albeit with some repairs from its days in the amateurs as well as a restored original (but maybe not to the jersey) crest. The jersey is without a doubt the one worn by Schock in the 71-72 season and remains just 1 of 2 known white 71-72 jerseys in the hobby today. 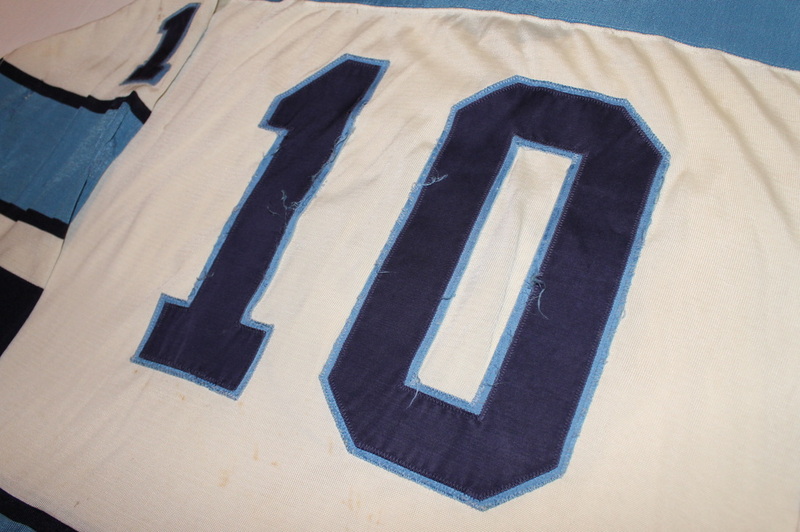 Can't argue with the tremendous eye appeal this well worn jersey has. General filth and repairs abound. 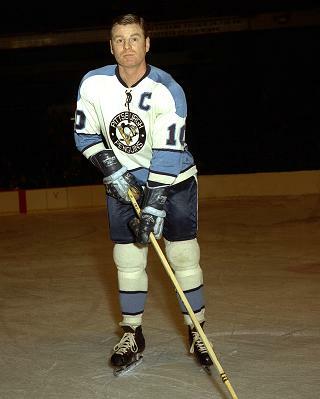 Also keep in mind this jersey began as a circle crest at the start of the 71-72 season and would have had the skating penguin logo added mid season. 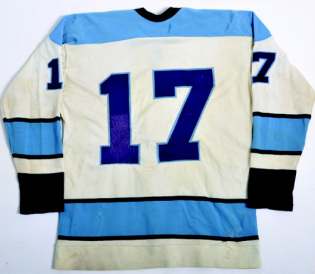 Great hockey numbers history include #17, which was being occupied by Ron Schock when Rick Kehoe arrived from Toronto. This is why Rick wore #8 until Ron had moved on from the team. Gotta love the respect in hockey and tradition surrounding the numerology. I think 17 is a lucky number for everyone right? 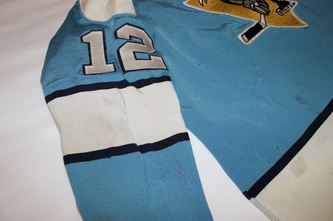 This jersey is from the 1971-72 season, and was worn with both the circle crest and the current skating penguin crest. 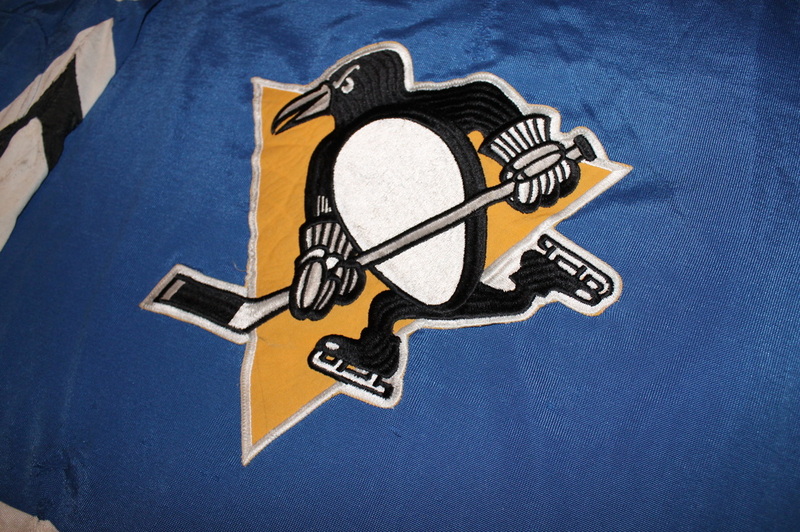 In 71-72 the Pens switched to the skating penguin logo mid-season, finishing out the regular season and the playoffs in these skating logo jerseys. The circle crests were removed from the jerseys and the new for '72 skating penguin logo was added. 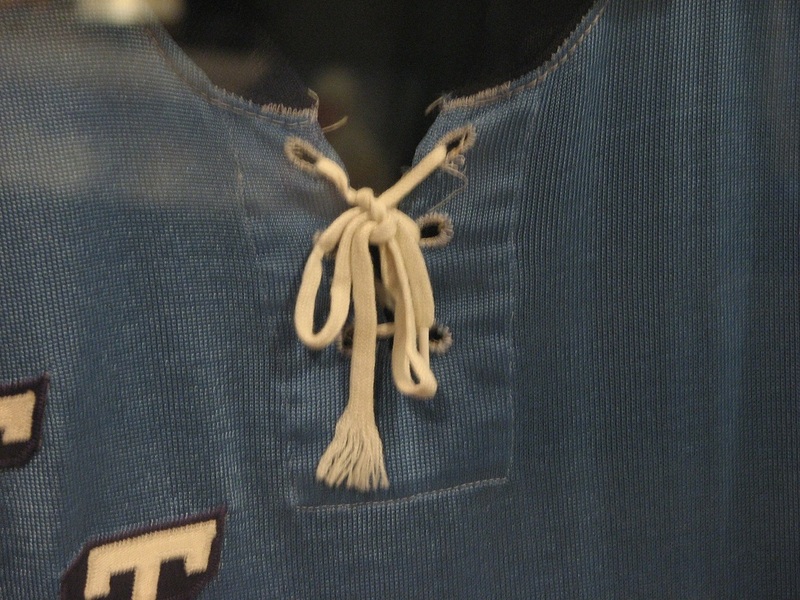 Evidence of the original circle crest is evident on the inside this jersey. 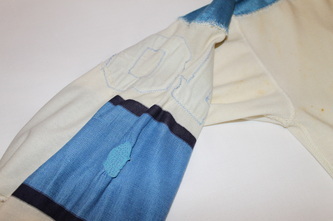 Fantastic shimmery blue durene make this incredibly rare style one of my favorites of the collection. The multiple sewn repairs and great game wear only add to the appeal. 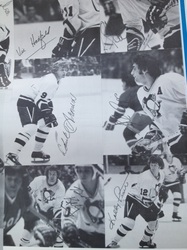 Purchased off a local Pens fan whose father had purchased the jersey off of Ken Schinkel himself back in the early 1970s. 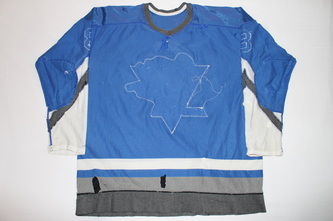 I originally spotted this jersey on the back of said fan at a game at the Igloo during the 07-08 season. I sparked up a conversation about the jersey, and although he had no intentions whatsoever of ever selling the jersey, I was still able to get him to give me his name and telephone number. After nearly 5 years had passed and I was about to get a different cell phone, I stumbled upon his number saved in my contacts and decided there would be no harm in trying to reach out one more time. I shot him a text with one last substantial cash offer to buy the jersey from him, and ironically enough he said he had arranged a deal with another buyer who had also spotted the jersey on his back at a game and that the deal was dragging along longer than expected. 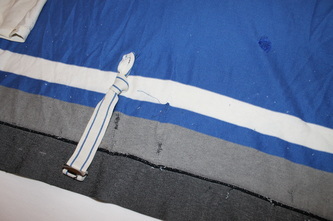 He said if he didn't hear back from his buyer in a week's time, he'd get back in touch with me. One week turned into nearly a month, but in the end I was offered the opportunity to buy. 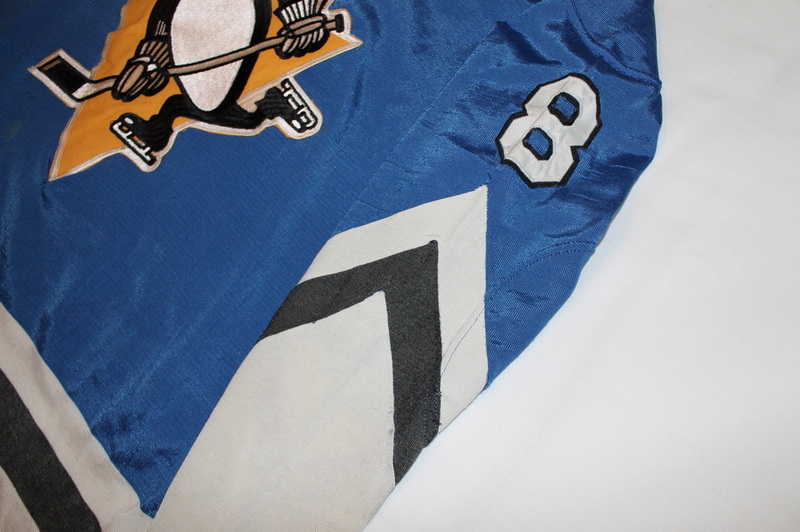 Needless to say I snapped it up and brought home one of the rarest and most desirable styles of Penguins gamers in team history. 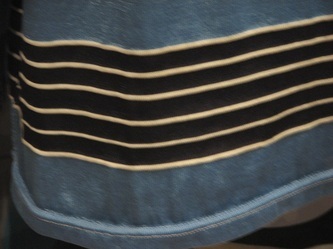 This is one of 4-5 known examples of this style known to exist today. 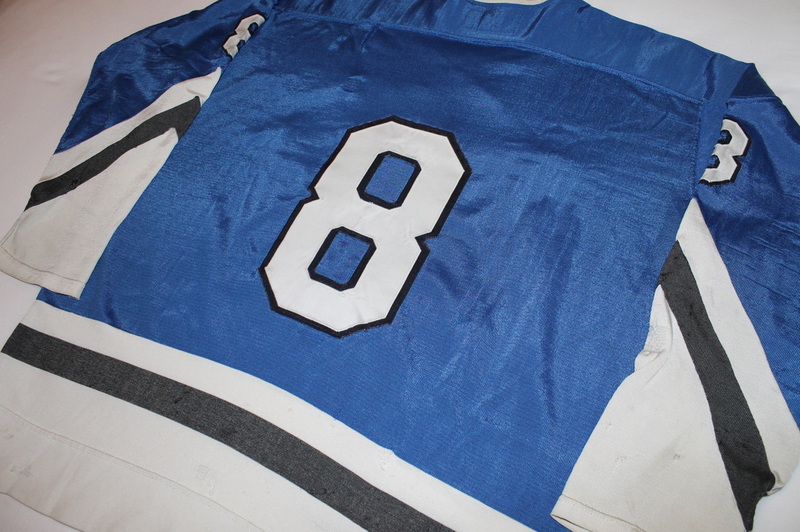 I am very pleased to include this historic jersey in the Steel City Gamers collection. The jersey features two layer twill sewn on numbering, as well as a trainer added garter type fight strap. 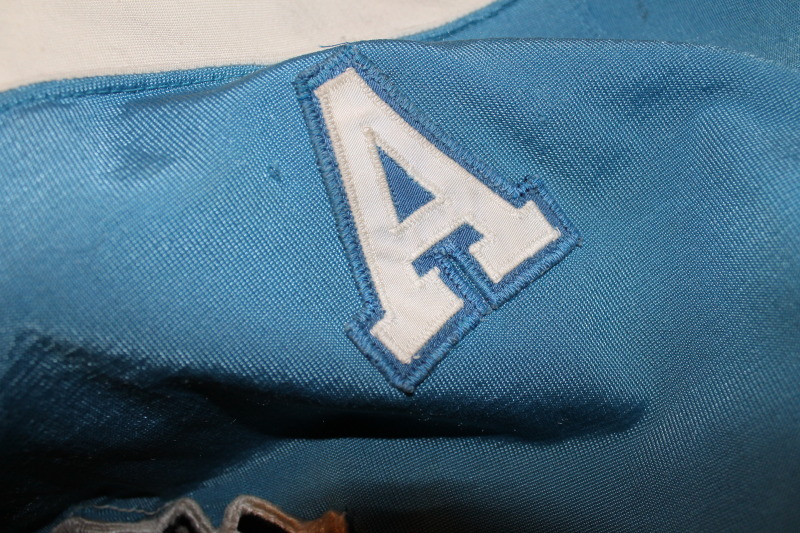 The assistant captain's A is also two layer sewn on twill, although the base layer is a light blue color that nearly matches the jersey perfectly. 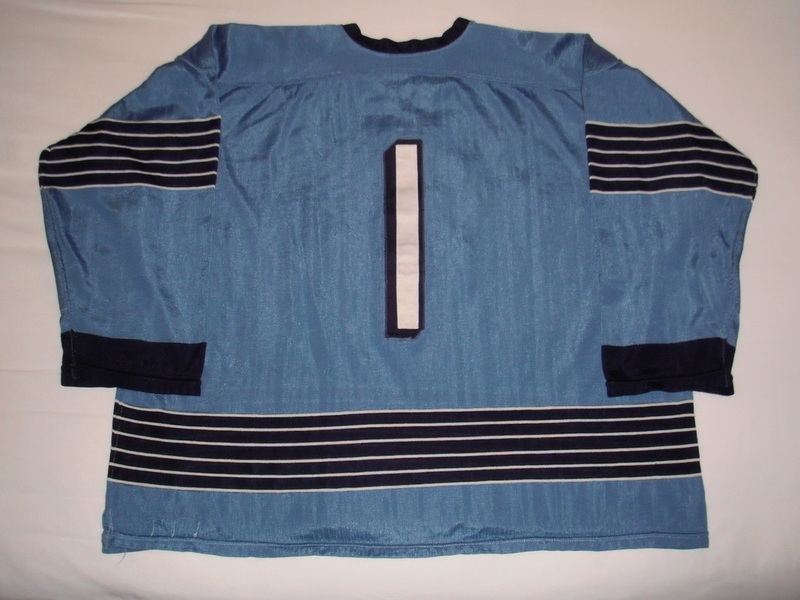 I am unsure as to why it isn't bordered in dark blue like the sleeve numbering, but I suspect it could have been a recycled A from another shirt. 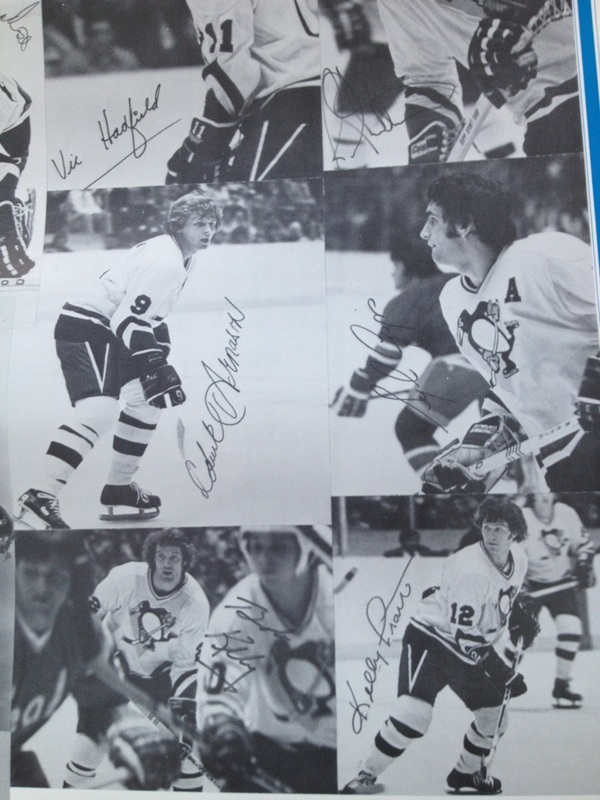 In 71-72 the Pens had 4 players wear the A as no individual player was given the title of team captain. Ken went on to coach the Pens as well as work in their front office. 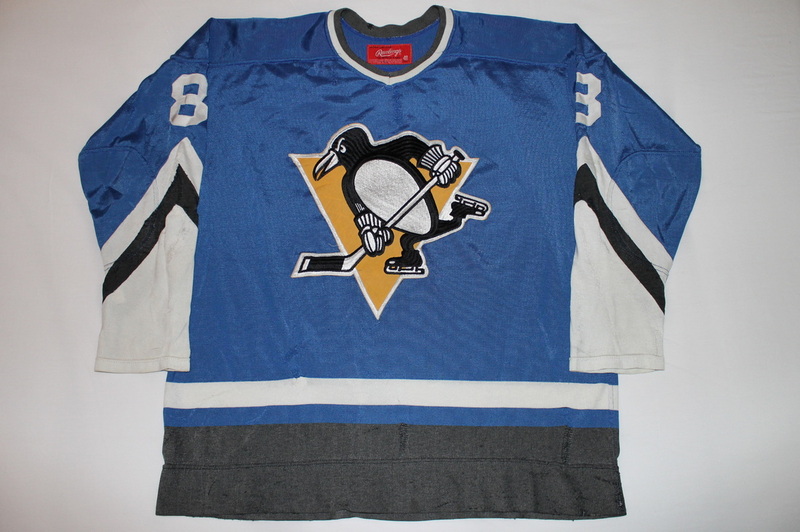 A great example from a very rare set of Penguins game jerseys. 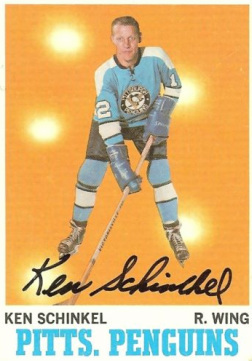 -Ken Schinkel is a former all-star forward with the Penguins as well as a former coach and member of the team's front office. Claimed by the Penguins in the 1967 expansion draft from the Rangers, Schinkel was one of the team's early stars and spent parts of six seasons as a player in Pittsburgh. He appeared in 57 games for the Penguins during their inaugural season, scored 39 points and became the first player in franchise history to be selected to an all-star game. The next season, Schinkel appeared in 76 games, recorded a team-leading 52 points and one again played in the all-star game. In 1969-70, Schinkel saw action in 72 games, scored 45 points and helped the team reach the postseason for the first time. 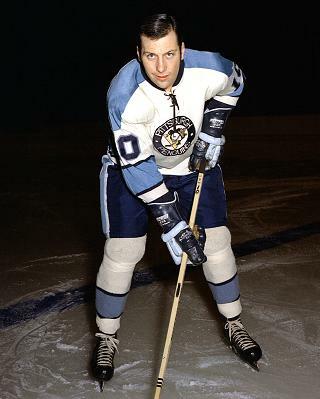 He also scored the first postseason hat trick in Penguins history when he netted three goals against the Oakland Seals in Game 3 of a quarterfinal series in 1970. 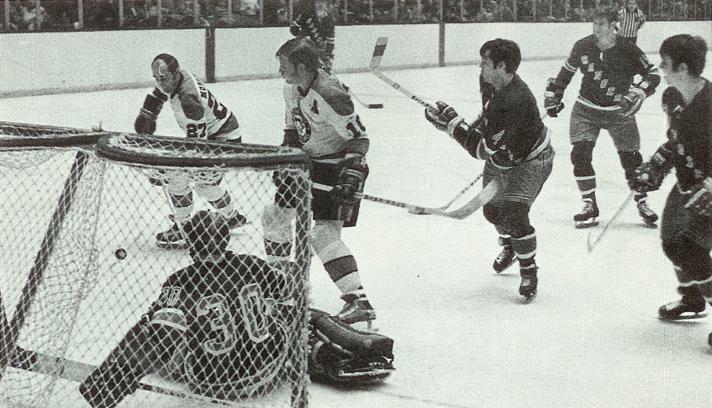 Schinkel was limited to 50 games and 34 points in 1970-71 but rebounded in 1971-72 when he played in 74 games and netted 45 points. 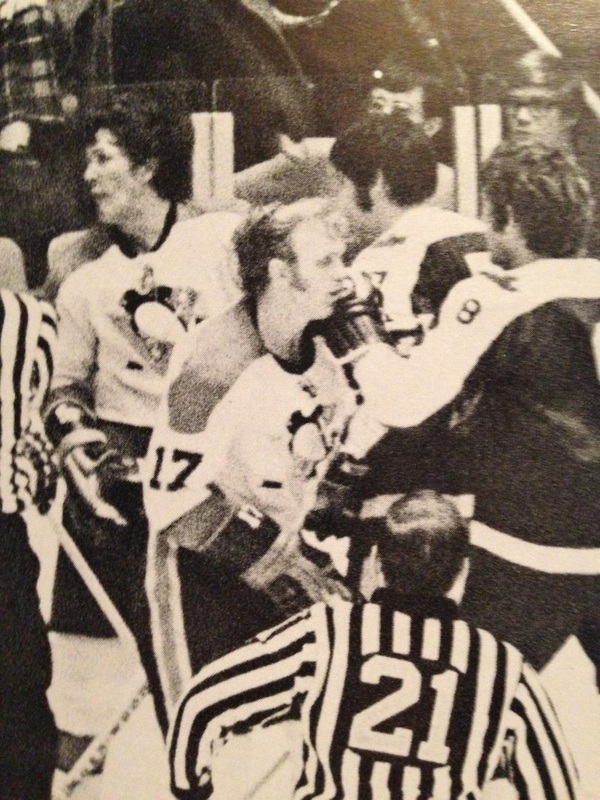 After scoring 21 points in 42 games in 1972-73, Schinkel retired as a player on January 13th, 1973 and replaced Red Kelly as head coach at age 40 just 2 days later on Saturday January 15th, 1973 where the Pens would beat the Los Angeles Kings in his coaching debut by a score of 3-1. 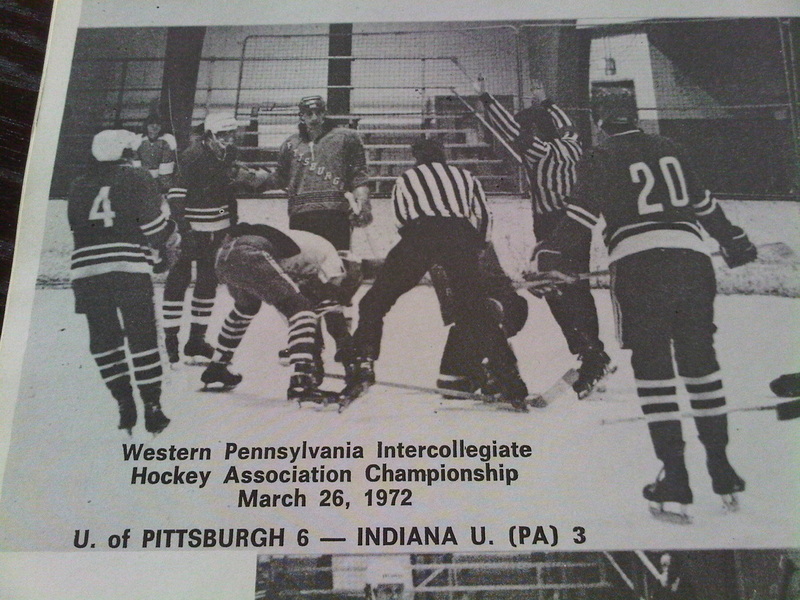 Under Schinkel, the team had a 15-18-3 record and missed the postseason. The following season, Schinkel coached the team for 50 games and had a record of 14-31-5 before being replaced by Marc Boileau, Feb. 6, 1974. 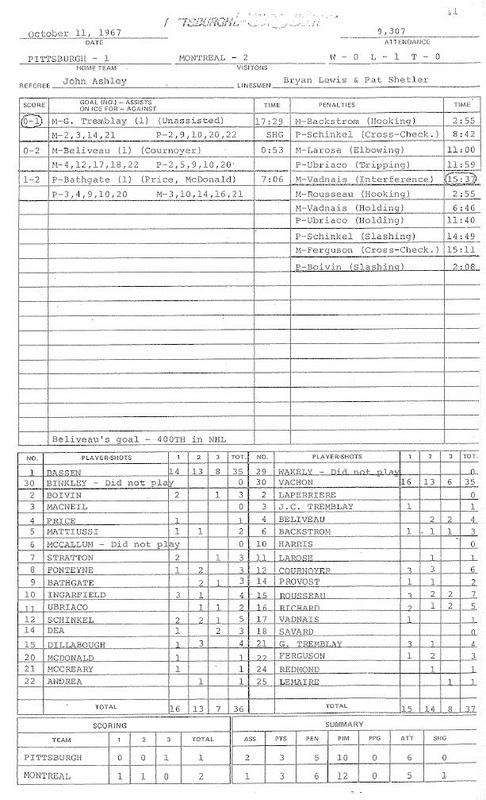 Schinkel assumed a front office position with the team and stayed in that position until he himself replaced Boileau, Jan. 17, 1976. 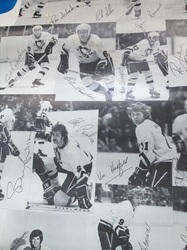 Under Schinkel, the Penguins had a record of 20-10-7 and reached the postseason where they fell to the Maple Leafs in a preliminary round series, 2-1. 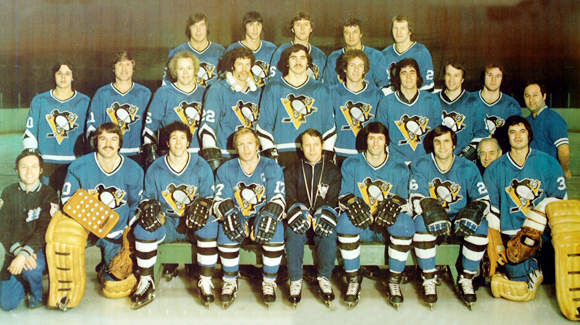 Schinkel's only full season as the team's coach was 1976-77. The team went 34-33-13 and qualified for the postseason where it once again lost to the Maple Leafs in a preliminary round, 2-0. Schinkel was replaced by Johnny Wilson in the following off-season. Schinkel again took a front office position and remained with the team until 1989. 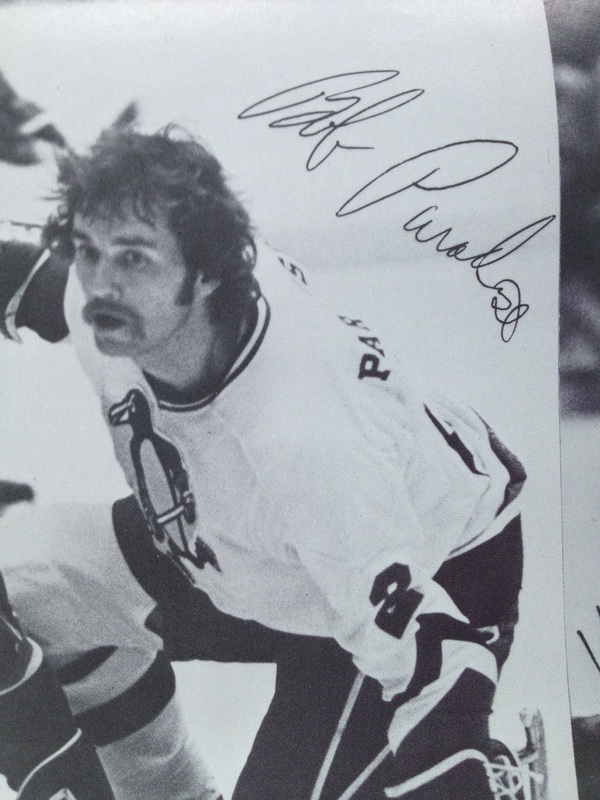 In 371 games with the Penguins as a player, "Schink" scored 236 points, 31st most in franchise history. 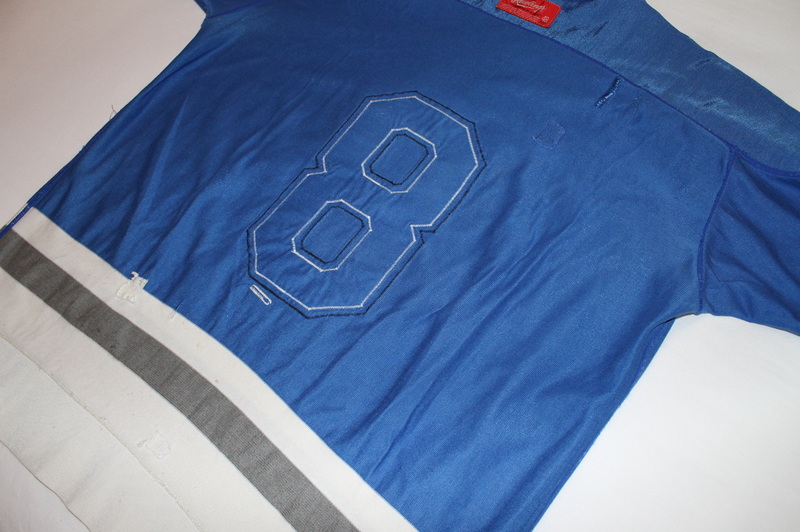 As a coach, Schinkel compiled a record of 83-92-28. "I was able to play here when I first came here in the (AHL). When I came here in the (NHL), that’s what I really remember. Coming into it for the first time in the NHL with the (1967) expansion. At that time, there was only 13,000 seats and it just looked like a monster stadium then with the heights of the ceiling and everything thing else." "Not really. I probably was so pumped up at the time. I know with the expansion, we were going to be in a tough battle right down to the wire. We were going to have to battle every night." 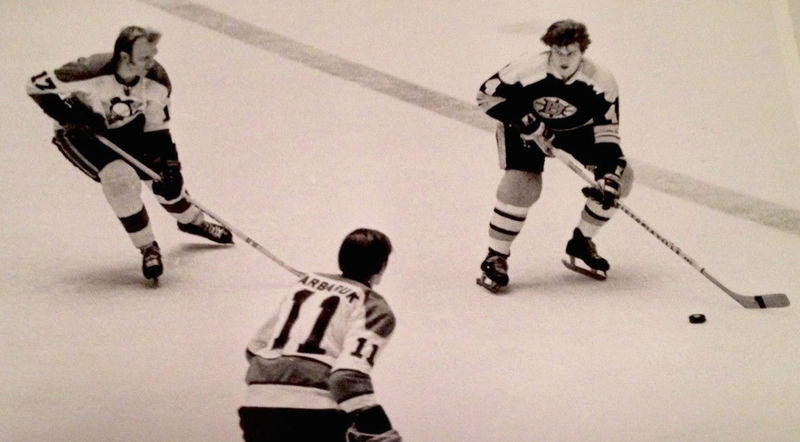 "That’s probably one of my highlights of being here was scoring that hat trick. I think he scored two for them if I’m not mistaken. Having played against him and ending up with a hat trick, that to me was a really a great accomplishment. Supposed to be a defensive type player and ending getting a hat trick checking Hull." "Yeah it is, it eats your craw boy I tell you. You’re up 3-0 and you end up losing the series 4-3, you just have to win one more. They were the ones lucky enough to win the game, 1-0. Just one of those games and breaks in the game that make the difference." "Yeah, I think just being able to walk up that hill and looking at the city from up here. 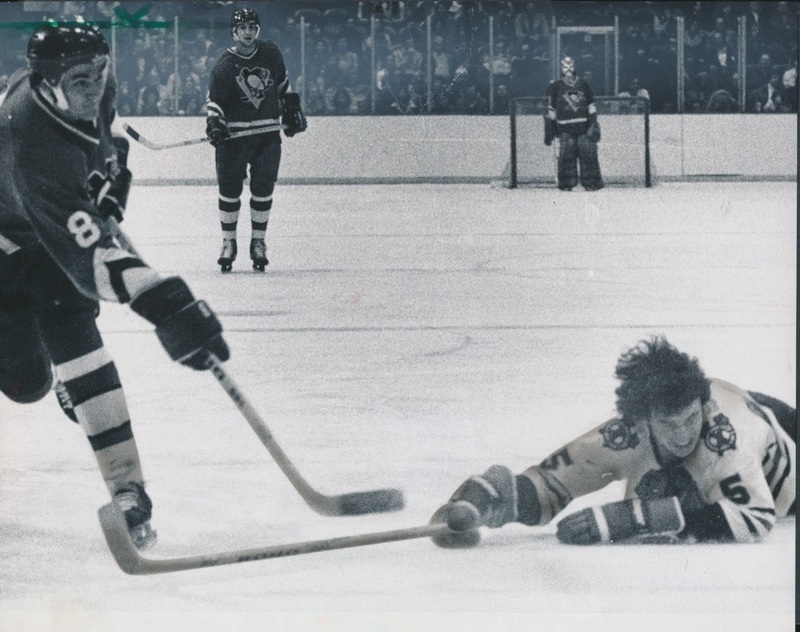 I don’t know what they plan on doing with (Mellon Arena), but it’s a landmark as far as I’m concerned." This jersey was acquired less the crest as it had been removed to be used for training camp purposes. 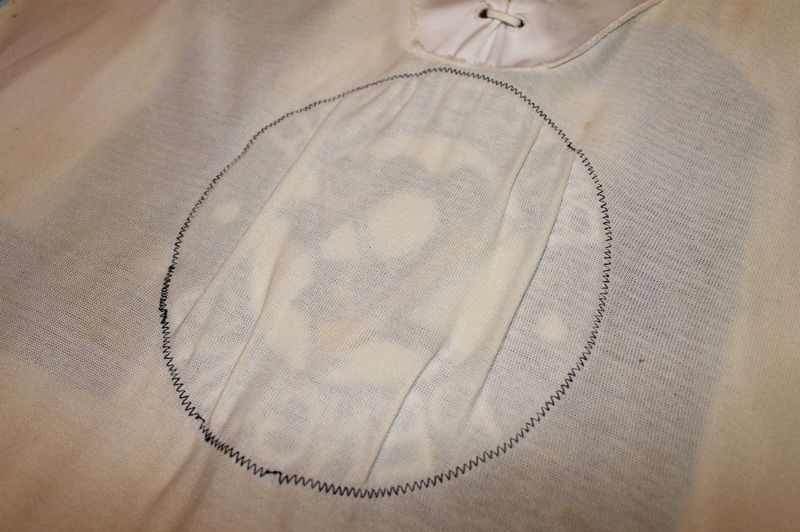 Years after I had owned the jersey, I was able to obtain an original 71-72 circle crest to be reattached. 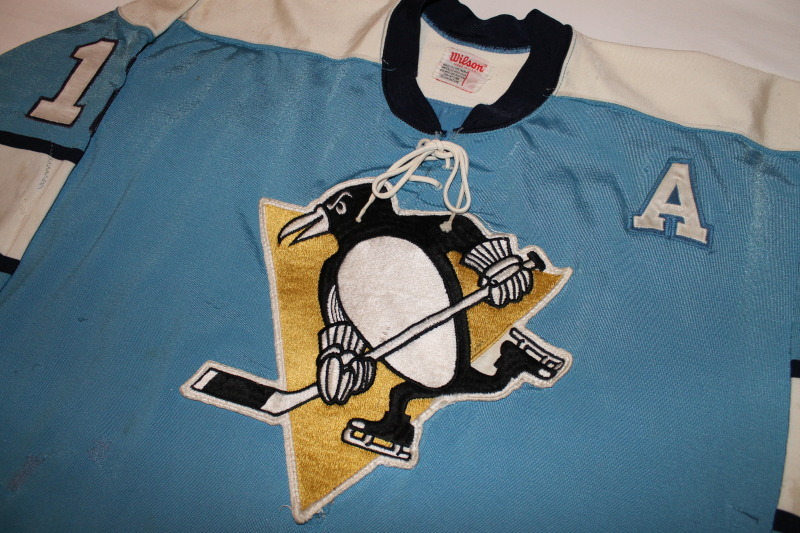 Although the jersey was recycled, and was last worn with a skating Penguin crest, it did begin life as it now appears, with the bold font 71-72 circle crest on front. 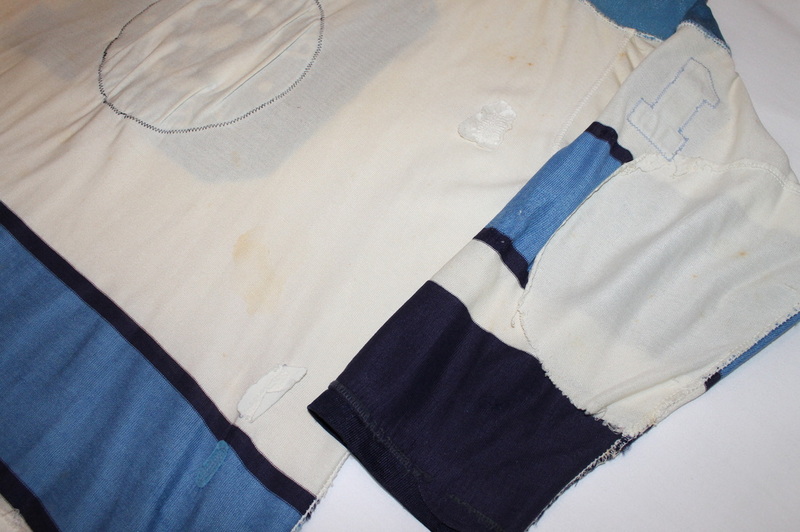 Since this is representative of the first half of the 71-72 season I feel it is an appropriate part of the historical timeline I'm trying to assemble and is easily the most heavily worn and repaired durene in my collection. 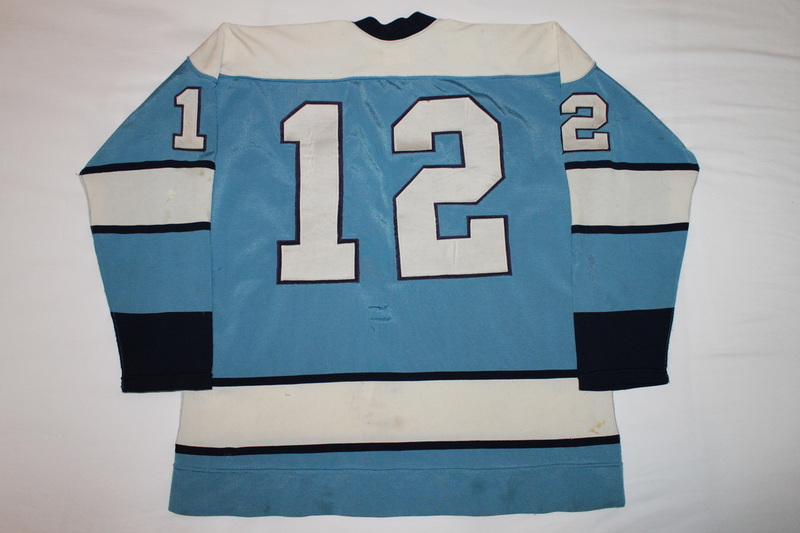 It appears to be a recycled Ken Schinkel as an obvious number change shows evidence of this having been a #12 prior to the #2. 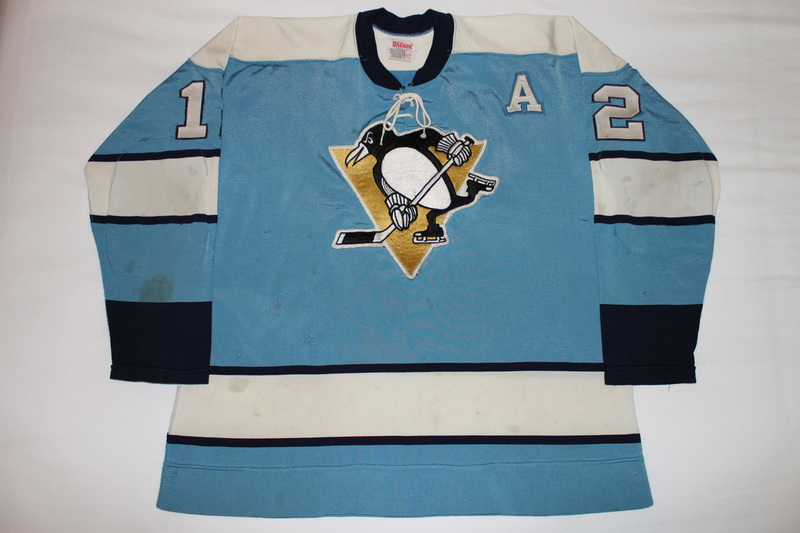 I know of no other 71-72 circle crest Penguins game jerseys in the hobby and can find no reference to any having sold at auction in the past. From any angle this one is a true beauty. Sized 50 it's one of the larger durenes in my collection. This 73-74 season's blue is really unlike any used in any other season. 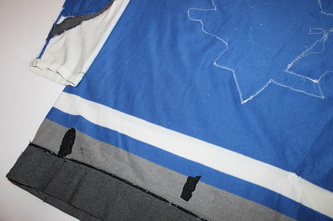 It does have a very bold and vibrant look to it. 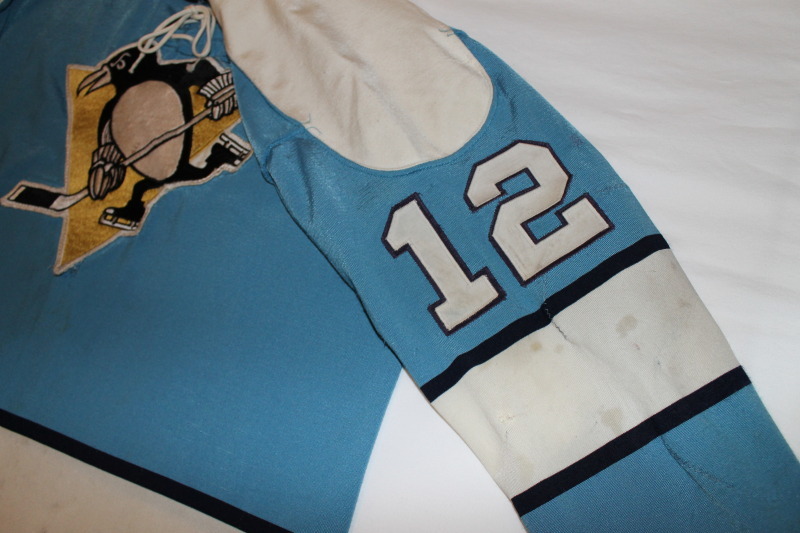 This is a blank team jersey from the 73-74 season that was given to a Penguins/Civic Arena employee upon request for a game jersey. Originally entered into the hobby back in 2006, and brought to me more recently by way of a Georgia based collector. The jersey has been authenticated by Rich Ellis and is accompanied by his original raised seal LOA. 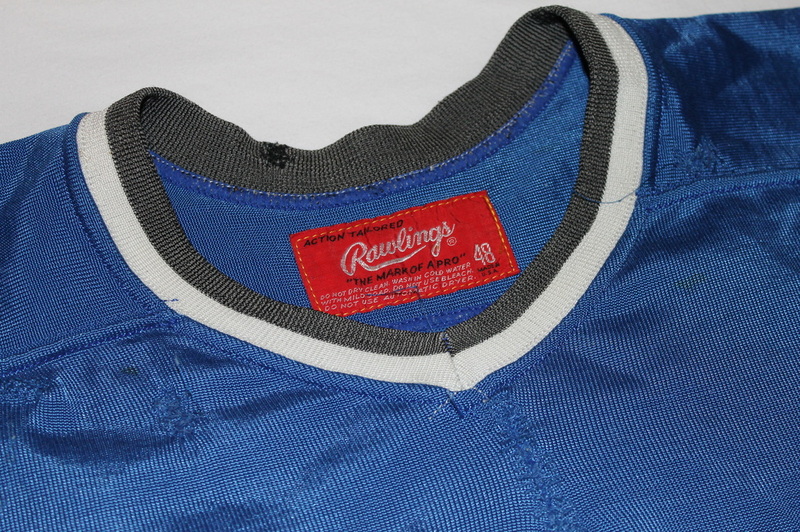 This jersey is the only example of a Rawlings durene that I've ever seen without a severely shrunken crest from repeated washings. 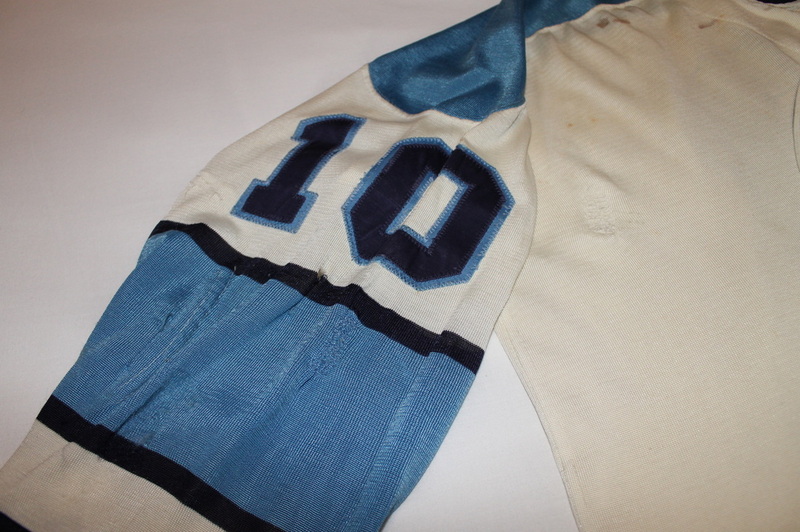 '73 also marks the first year that the white jerseys were worn at home. 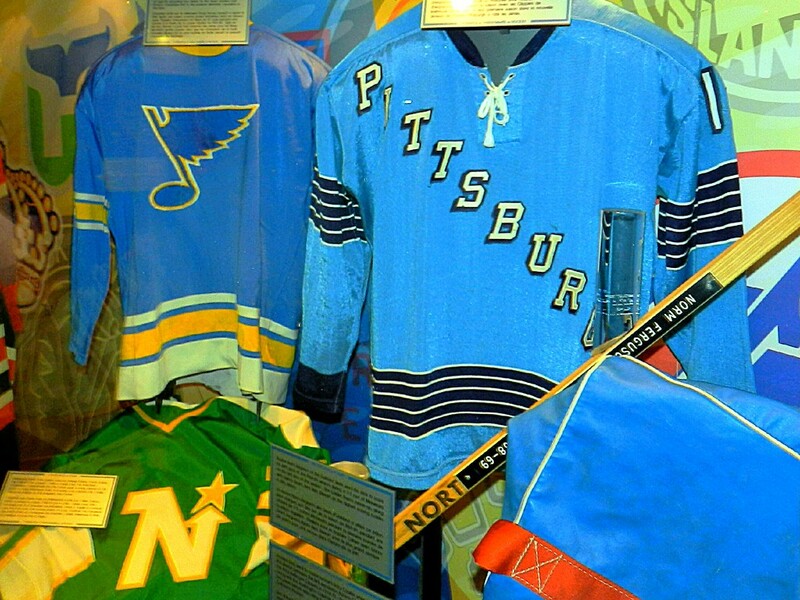 A beautiful jersey in every regard. Penguin perfection in my book. No numbering was ever added to the jersey. This jersey is as the team would have received them direct from the manufacturer. This particular jersey can be denoted as a 2nd set as the Rawlings tag is positioned on the inside hem vs. the inside collar. 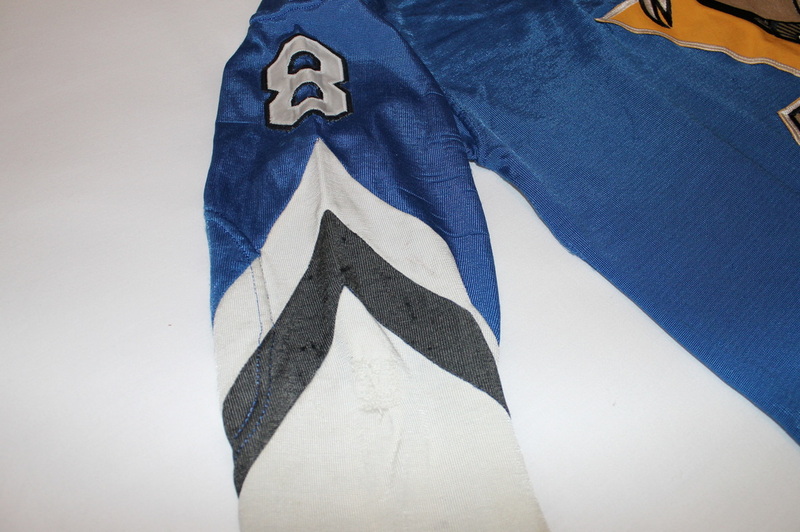 Double thick reinforced elbows, but no fight strap as those were added by the equipment guy/customizers back then. This jersey shows its age only in it's milky "antique white" coloring and is likely the most pristinely preserved Pens durene out there. For that reason alone it holds a special place in my collection, and is one I won't likely ever part with. This Rick Kehoe jersey is one of the only Penguins jerseys known to the hobby from this near extinct set of 1974-75 road blues. 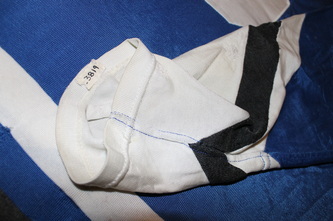 They are immediately distinguishable from the later 75-76 and 76-77 sets as they have a white hem as opposed to black. 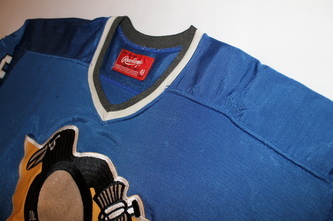 A subtle but obvious difference to the trained eye, it's what sets this jersey apart from nearly every other chevron sleeve road blue Pens jersey known to the hobby, of which there are only a handful. 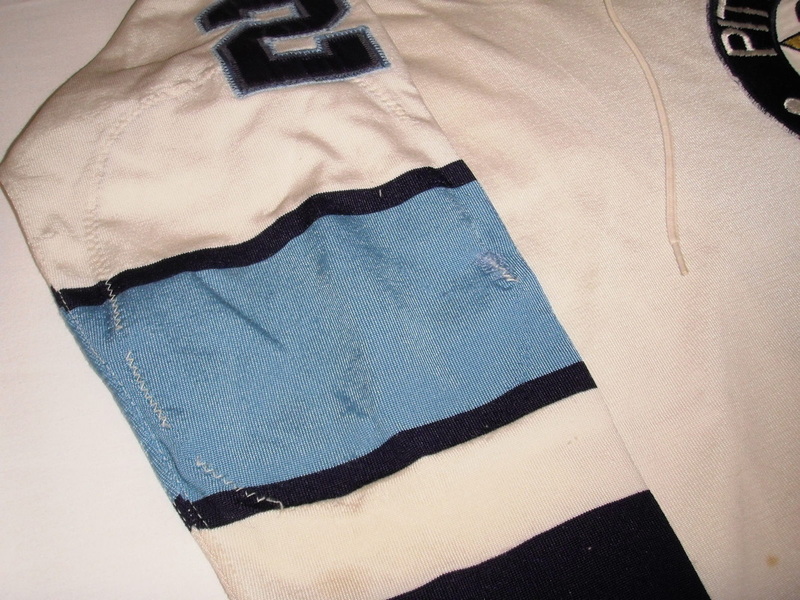 This set also has double layer, black on white tackle twill numbering as opposed to the single layer white used in following seasons, making for a very well made jersey. 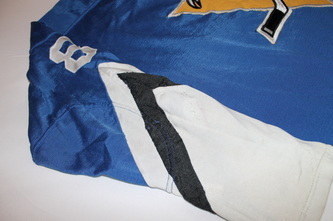 Everything on the jersey is sewn on including the incredible intricately embroidered skating penguin crest, which is situated noticeably closer to the collar than the ones on the black hem chevrons. 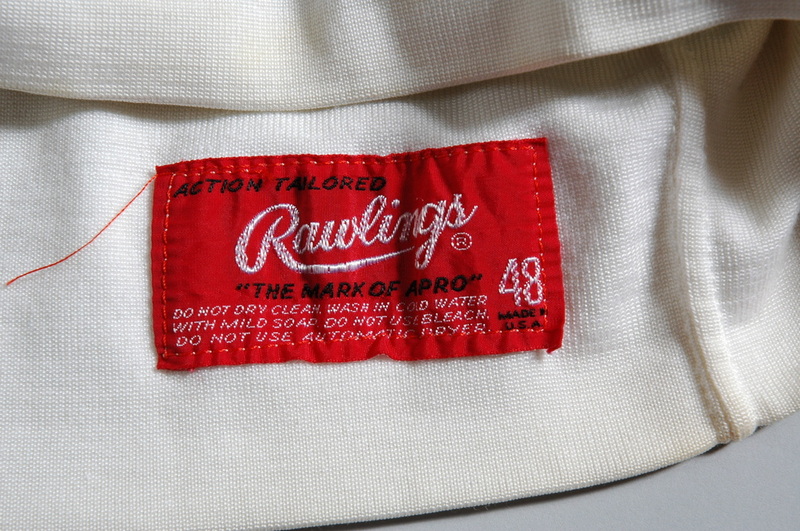 Manufactured by Rawlings in a silky, shiny durene fabric and sized true at 48. This one comes from the personal stash of long time collector and noted Pens historian Jim Kubus, whom was graciously willing to sell me this jersey to help further complete my collection of vintage blue durenes. He had owned the jersey over 11+ years prior to my finally being able to convince him to sell, but come Thanksgiving weekend 2012, the timing was apparently right. I would like to thank him for his willingness to finally let go of this fantastic shirt, and for playing an integral role in my becoming a game worn collector after being introduced to him through his terrific website from which I have gained great knowledge about the hobby and Penguins team history in general. This jersey shows great wear with many fabric backed repairs. 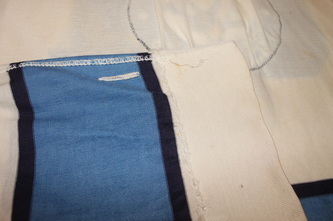 Several on the lower white hem portion, as well and on the shoulders and sleeves. 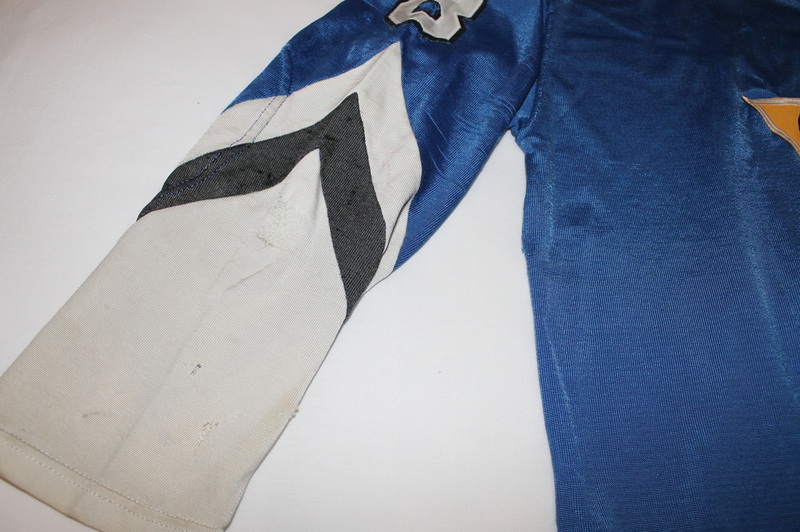 Some evidence of the TV nameplates having been on and off as well as remnants of an original fight strap remain. The attractive double layer numbering is sewn on through both layers of the number holding it steadfast to the jersey even after an entire season of wear. 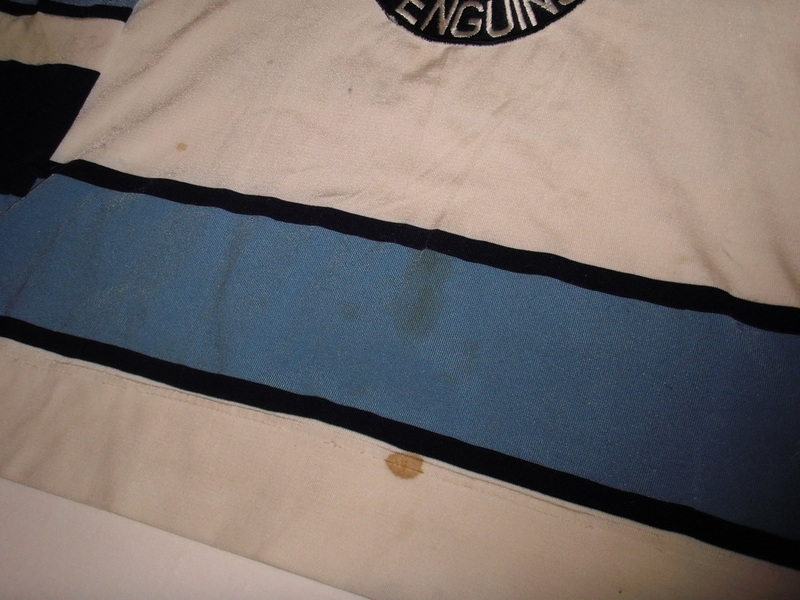 Considering the use this jersey saw it displays exceptional original shine to the durene. The cuffs actually still show the wrinkles from being rolled up over the bottom of the elbow pads as game photos show Kehoe preferred to wear them this season. 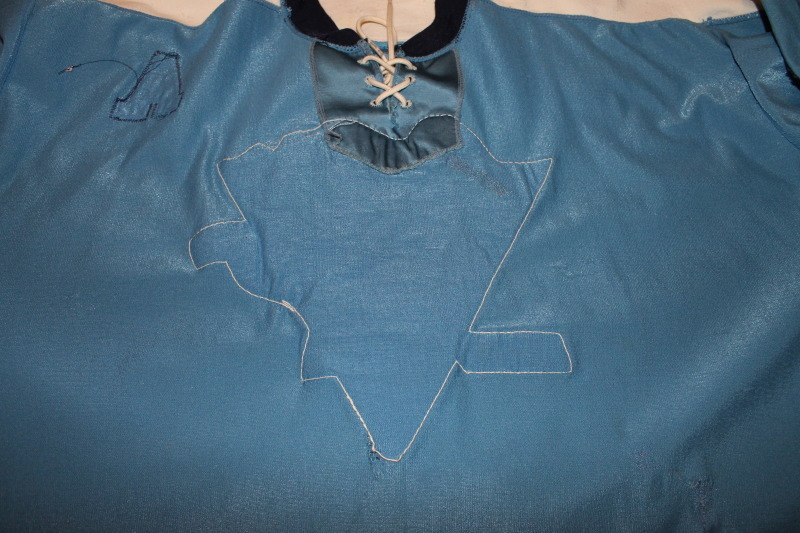 Plenty of inner stretching to the durene in the elbow areas attest to the many games of wear it undoubtedly saw during the 74-75 season, spending nights in nearly every barn in the league. 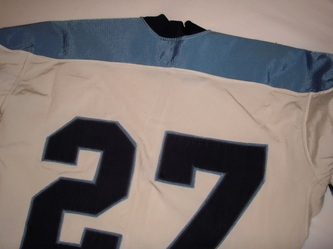 Solidly photomatched and as eye appealing as they come, rivaling any Kehoe jersey in the hobby in terms of rarity of style and aesthetic appeal. I am very pleased to own this one and before you ask, no it's not for sale. I was fortunate enough to obtain this jersey though the help of a good friend Casey Samuelson. 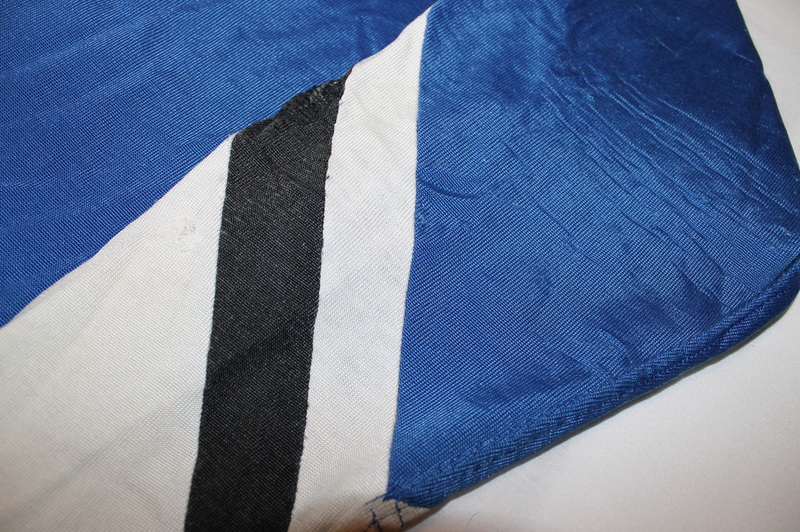 A once believed lost style, I was astonished to receive news that one existed...the elusive "white chevrons." Once an opportunity to bring it home presented itself, I wasted no time in closing the deal. 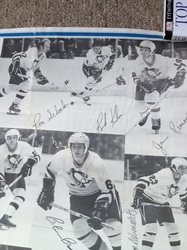 Easily the rarest 70's Pens durene style and in my opinion one of the most eye appealing of all time. 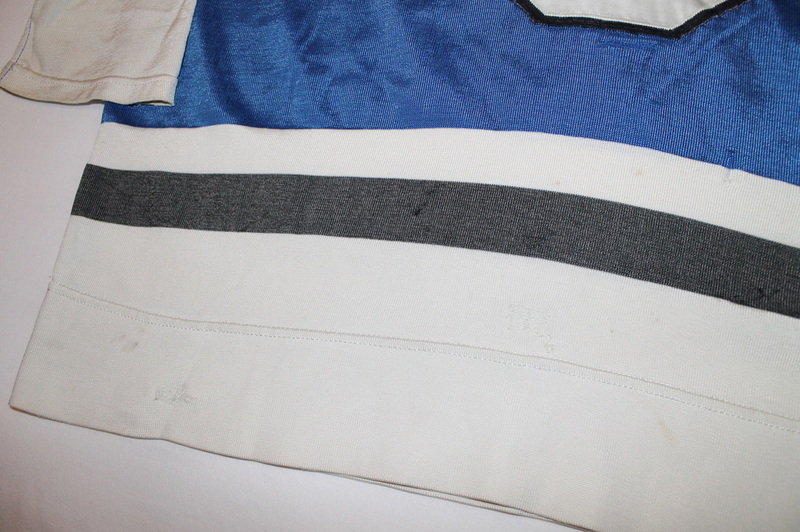 Worn by both Ron Lalonde (with the A) and Lew Morrison, this jersey shows excellent game use and several team repairs. A special thank you goes out to Kim Kubus for providing me with this tremendous photomatch of the jersey in action. This extremely rare jersey is one of the highly coveted "chevron sleeves" styles from the mid 70s. 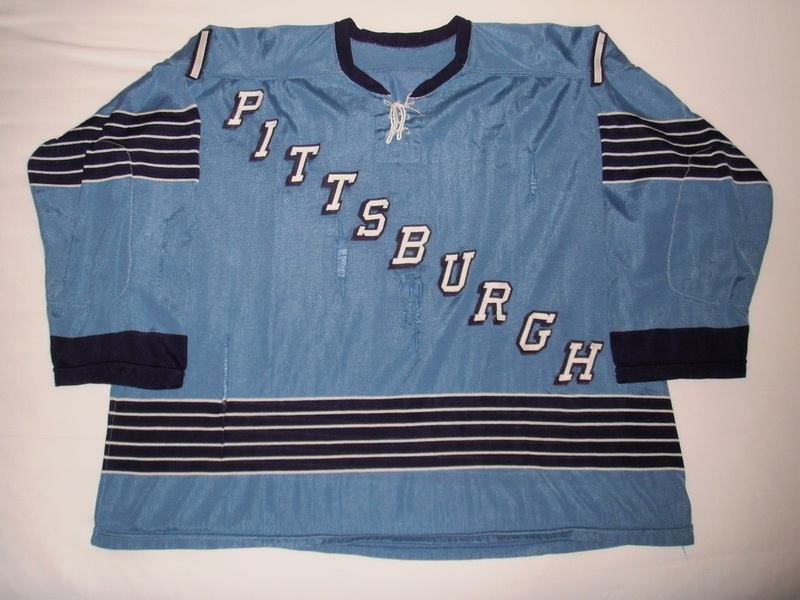 These jerseys get their name from the chevron shape the sleeve stripes are configured in, and have become such a sought after style among the Pens collecting community that "chevron sleeves" is all you need to say to perk the ears of those in the know. They are one of the rarest styles of early Pens durenes with 5-6 known examples left in existence and are highly collectible for both their rarity and aesthetic beauty. 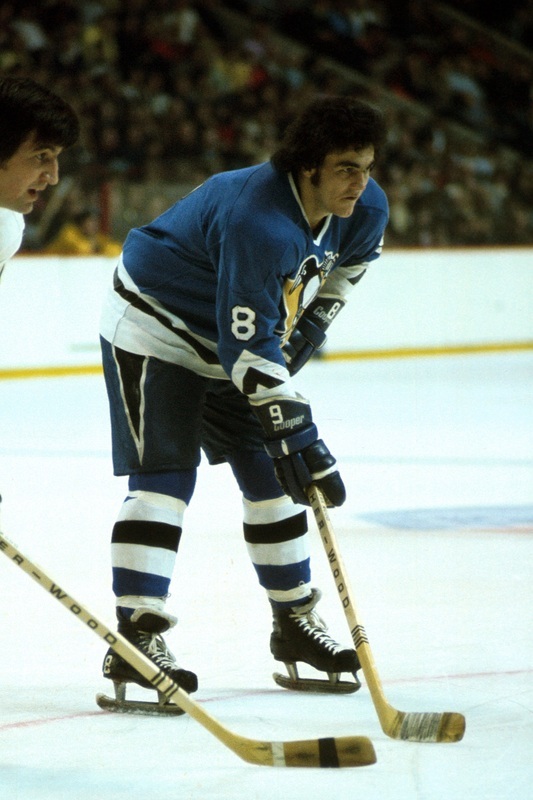 Many argue that this is the best of the Pens' early blue durene styles. I thought for a long time my collection would never have a representation of this rare style, so to be able to fill that void with a marquee player like Kehoe brings me great satisfaction. 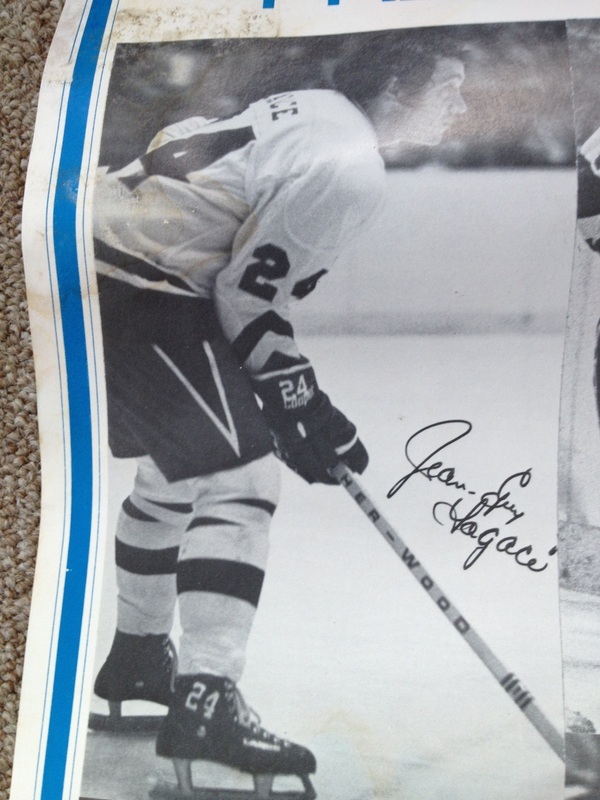 I want to thank NJ based collector Jason Seidl for his willingness to let go of this vintage gem to nearly complete my Pens durene collection. An outstanding shirt I am very proud to own, and quite possibly the best Kehoe representation out there in terms of rarity, wear, and style. 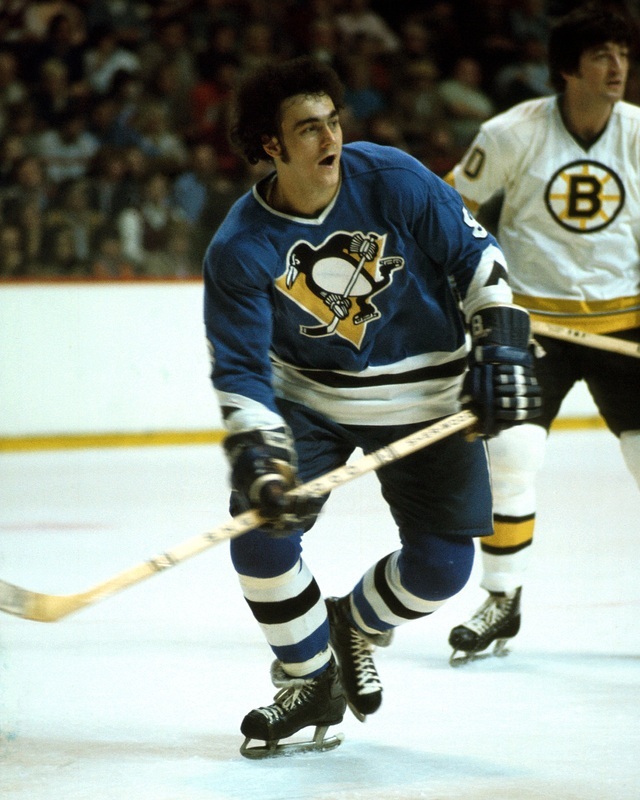 Rick Kehoe, somewhat surprising to many, is in the top 3 or 4 in just about every major offensive category in the Penguins record books. 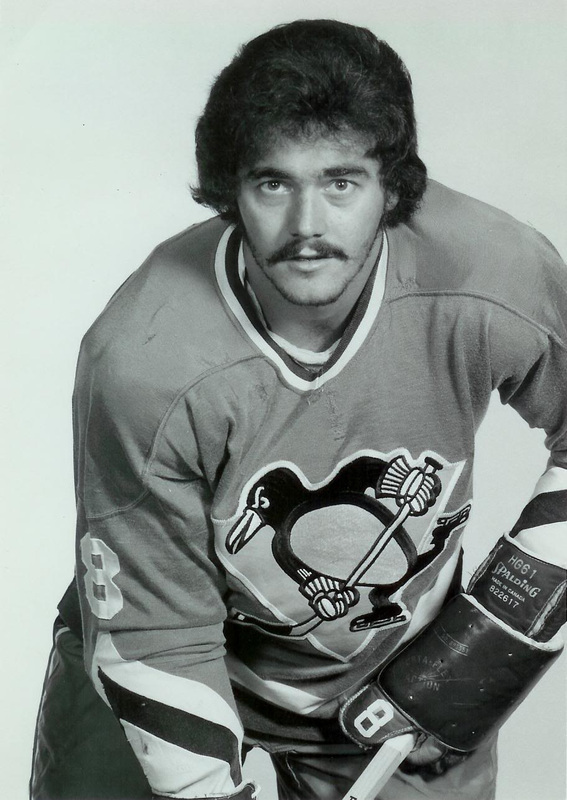 There’s points (Kehoe’s 636 rank third behind only Lemieux and Jagr), there’s games played (722- 4th) and goals (312, 4th). 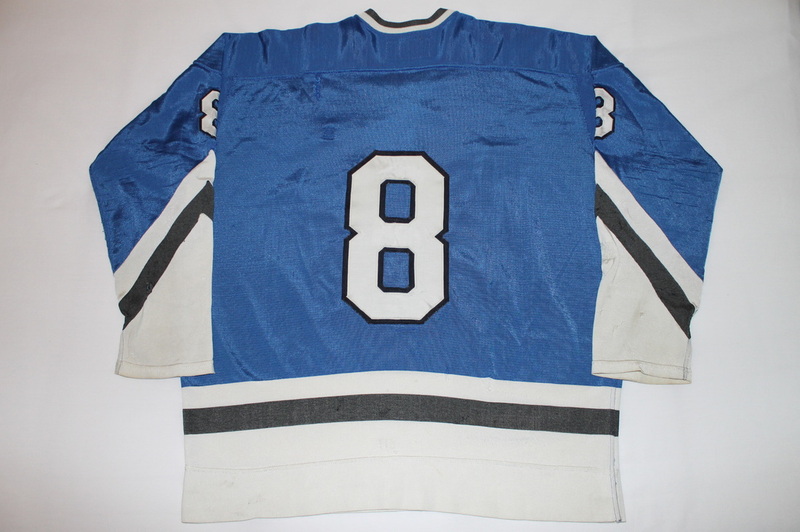 Even more noteworthy is the fact that Kehoe only recorded 88 penalty minutes in his entire career. 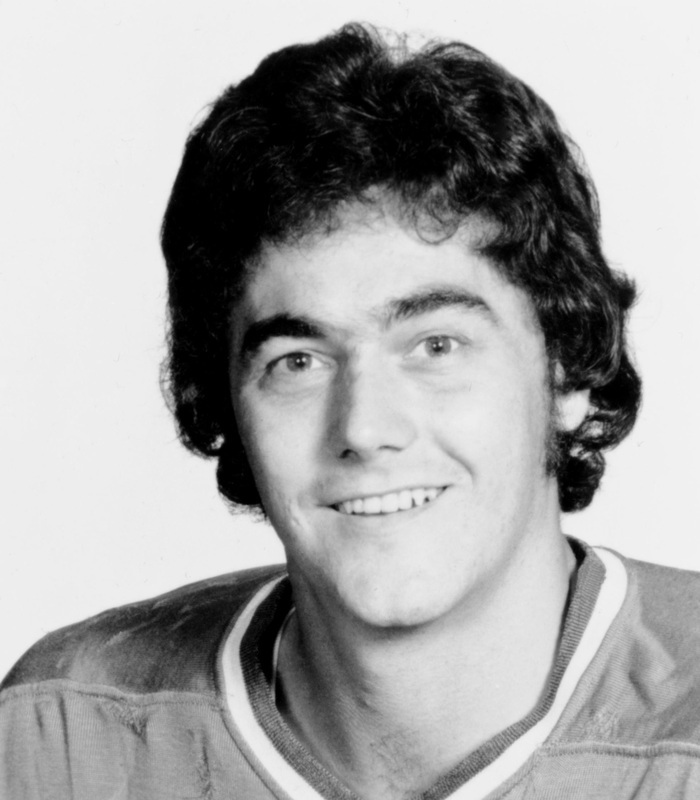 Rick was awarded the NHL's Lady Byng trophy in 1981 for his gentlemanly play. 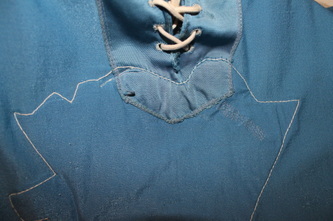 This historic garment has some of the most incredible repair work I have ever seen on a game worn jersey. 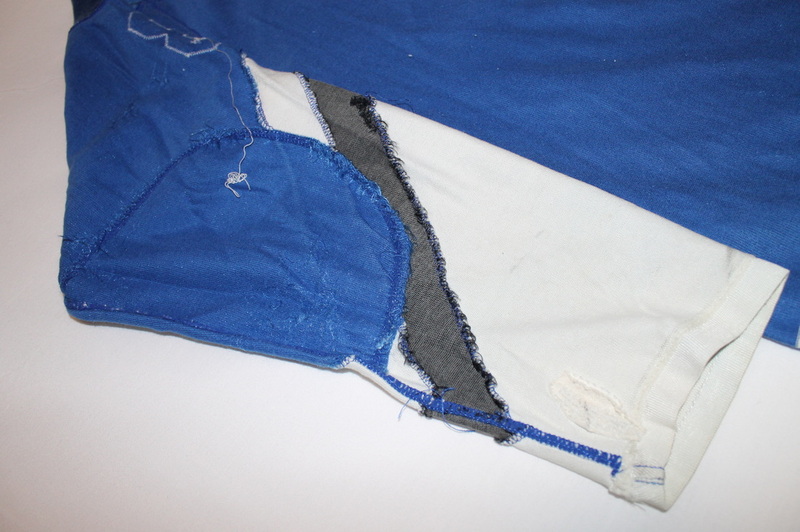 Several dozen sewn and fabric backed repairs are scattered throughout. 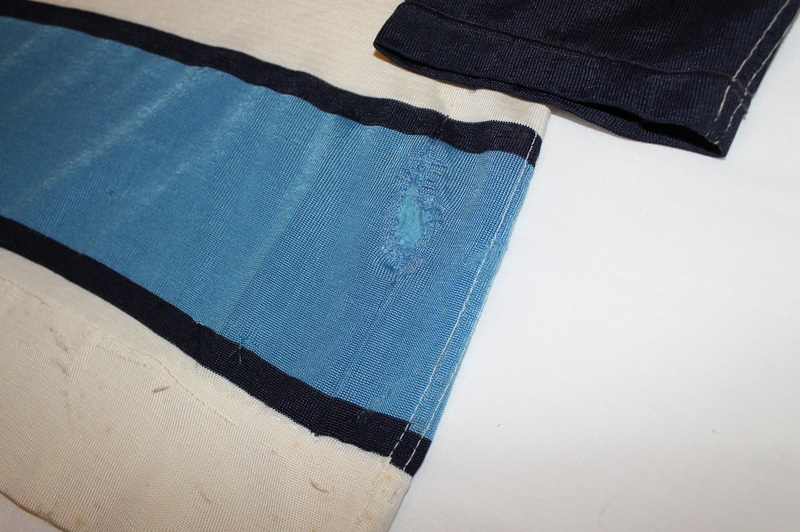 The sleeves show tremendous wear and are a mass of sewn repairs. 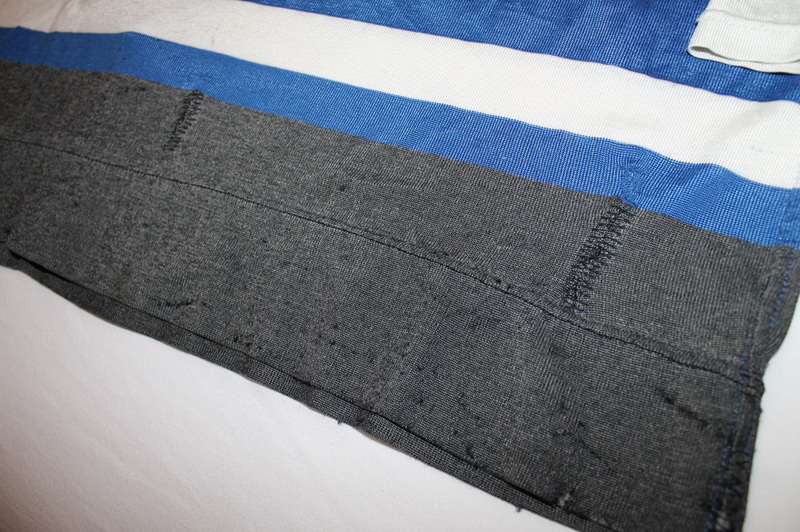 The hem shows several Frankenstein type repairs as well. I bet there isn't a 6" x 6" square of the jersey anywhere without a fabric backed repair of some kind, there's even 2 repairs on the knit collar. 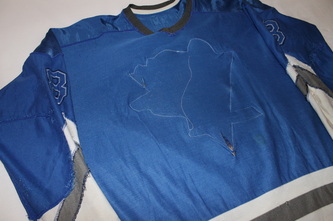 It's amazing when you look at it inside out, considering the level of work and amount of time that must have been put into keeping this jersey intact for additional use. 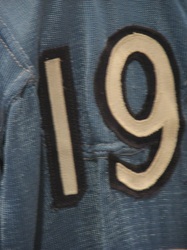 All original cresting and numbering and of course it's solidly photomatched. 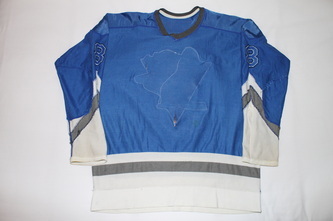 I can't think of anything that could add to this magnificent jersey to make it any more desirable...except perhaps it having had the opportunity to have been worn in a Stanley Cup Final. 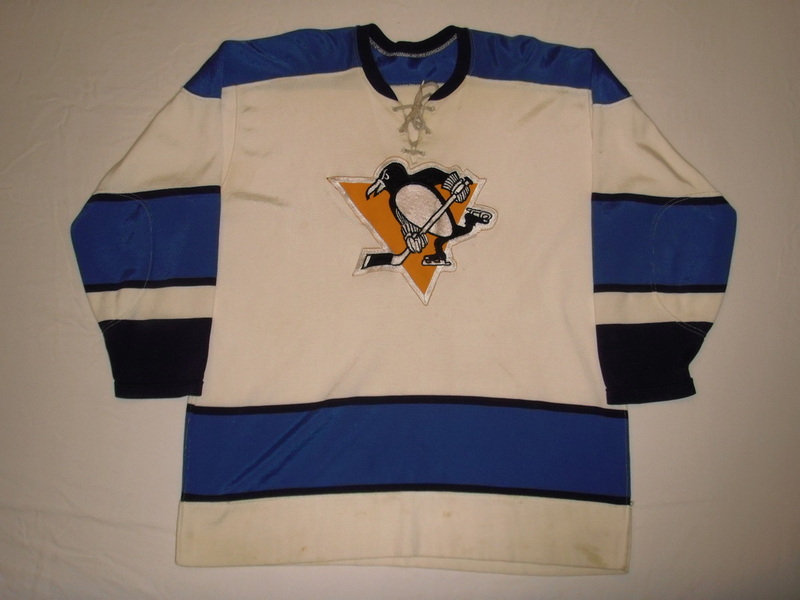 Unfortunately, the reality is the Pens were a basement of the league and near bankrupt team back then, so it's a miracle that relics like this old game jersey somehow survived. 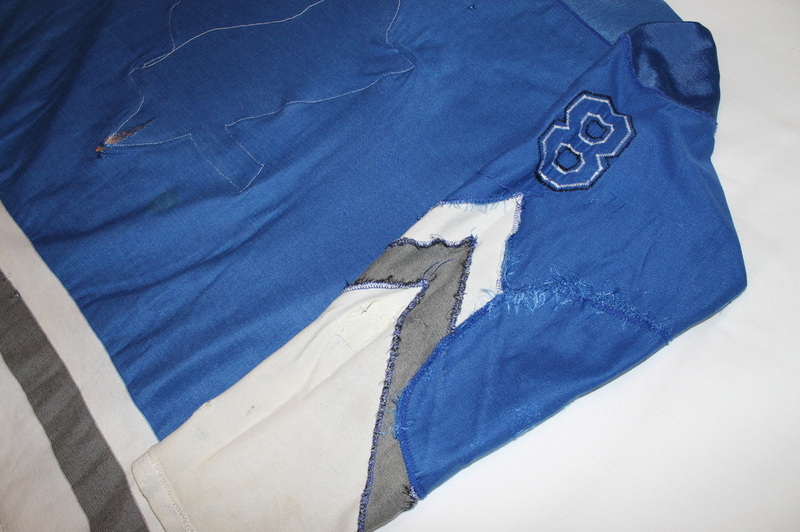 From an era when game used memorabilia was just dirty laundry, this one got tucked away safely for us to enjoy today some 35+ years later. Even Kehoe himself hadn't seen this one in years, so it's nice to know it's now resting safely in my closet. 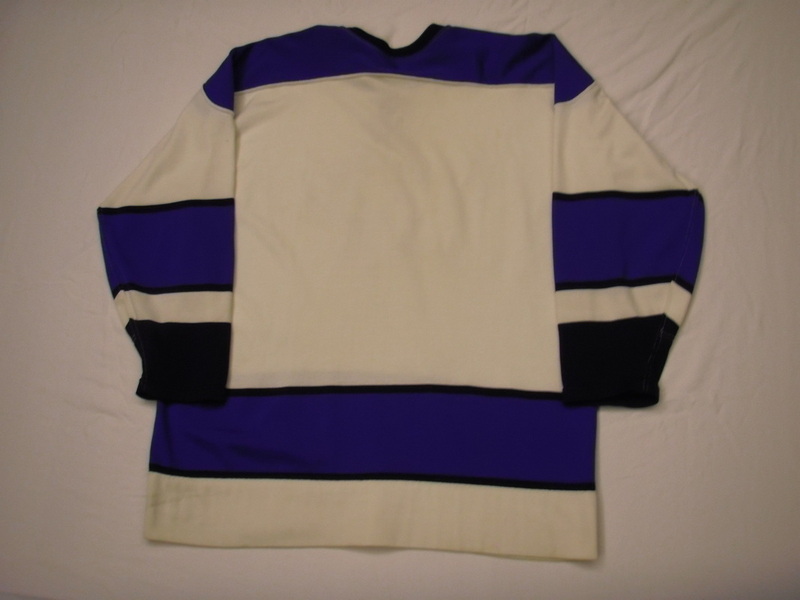 These "road blue" chevron jerseys were actually worn to begin the 75-76 season at home in the Igloo. 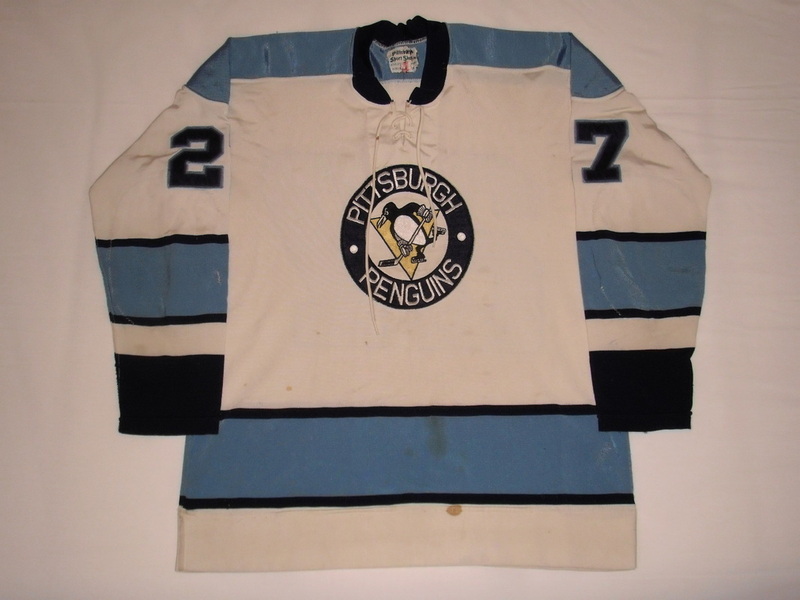 It turns out the Pens had problems with the black portions on their home white jerseys fading to a greenish hue which was actually documented in the paper as the reason why they donned the blue in the opener and in early games that season. (See here) It is documented that this road blue set was worn both at home and on the road up until at least October 21st, 1975, essentially the first 2 weeks of the season until a replacement white set could be ordered. 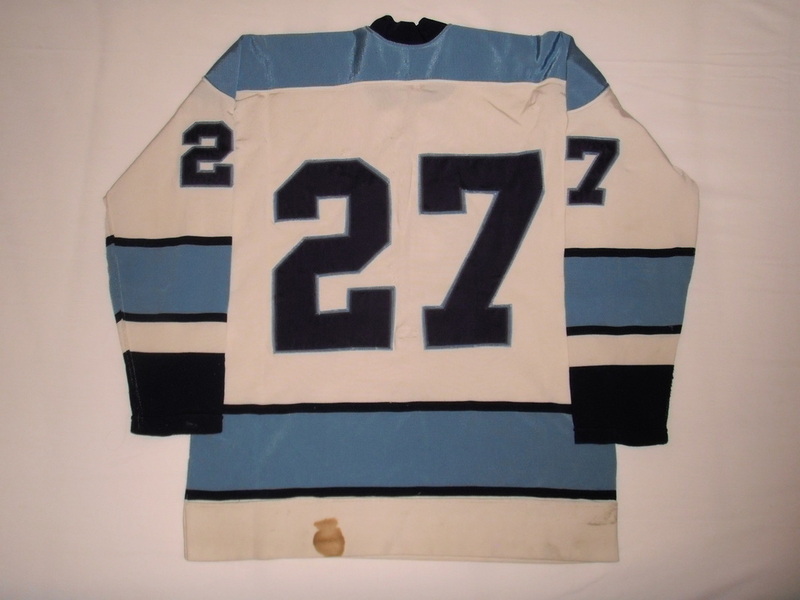 There are "no known survivors" in terms of the white chevron set from 74-75 and they did not wear it again in the 75-76 preseason but rather reverted to their 73-74 off center crested set. 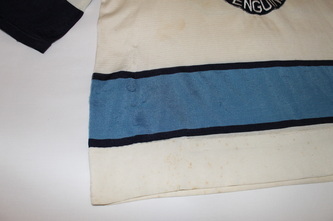 It appears the white chevron set may have had their crests removed to be recycled onto the new set of incoming whites, and the rest of the jerseys were simply thrown away. 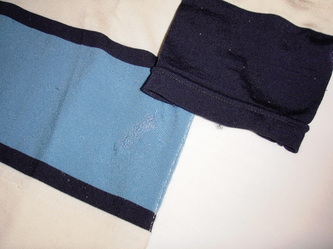 This makes the blue set the only remaining chevron sleeve examples from 75-77. 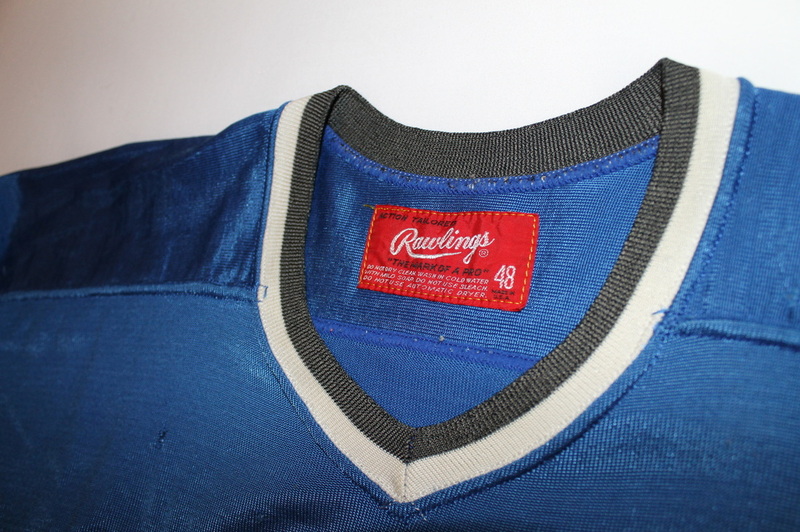 There is another set of blue chevrons from the 74-75 season which featured 2 layer numbering and originally had names on the back, but it is believed they were stripped of their crests and names for recycling purposes as was common practice back then. 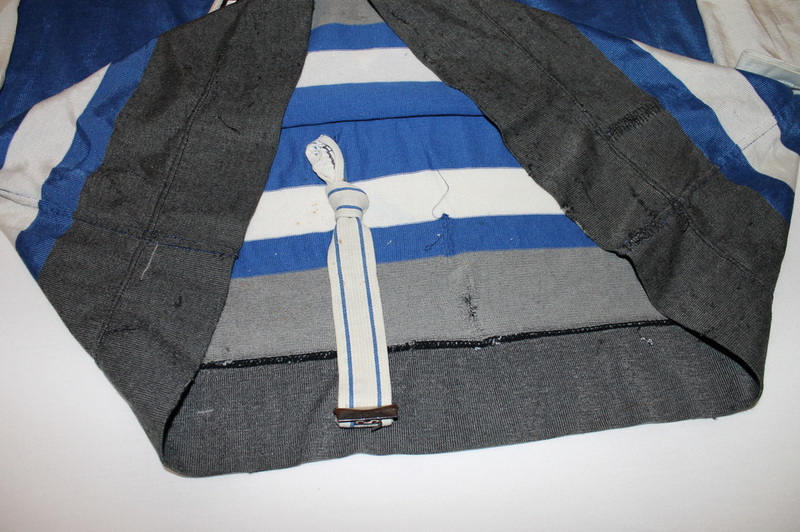 They also had a white hem rather than the distinctive charcoal/black. 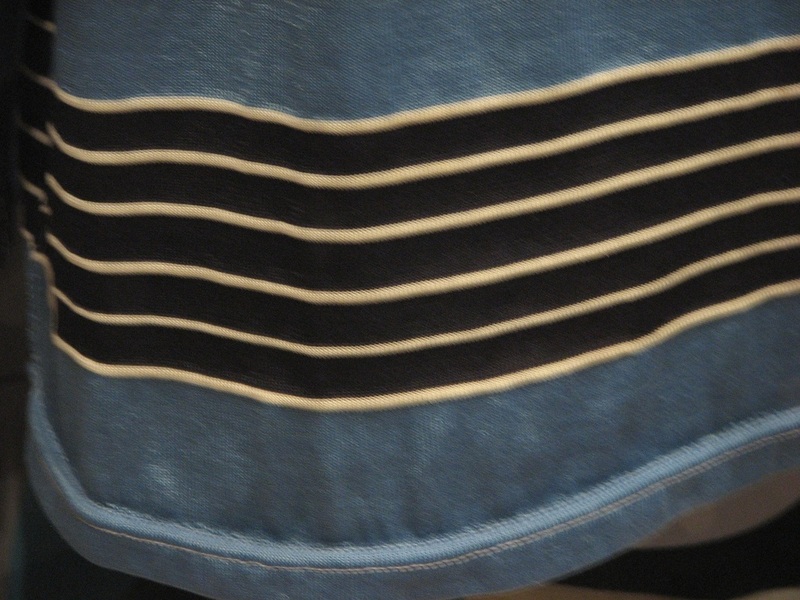 Very few of any of these chevron styles survive today. Some photos of the lost white 74-75 set can be seen below, taken from a Schaefer Beer promo poster from 74-75. 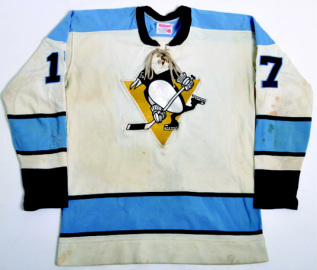 This white set was being worn when the Pens fell 3 straight games to the Islanders in the '75 Stanley Cup Playoffs to become only the second team in NHL history at the time to lose 4 straight to drop a series. Perhaps it was an omen they weren't to be worn, or seen ever again. 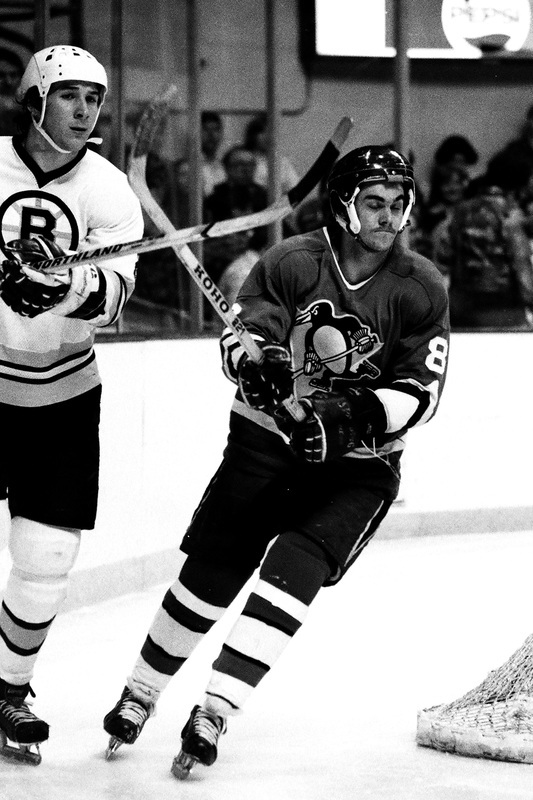 When you think of the greatest players in Pittsburgh Penguins history the name Rick Kehoe has virtually vanished from memory. 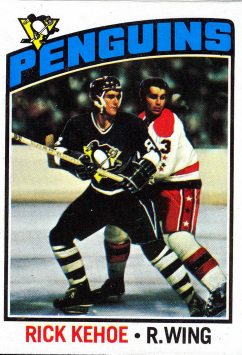 But there was a time when you could argue that Kehoe was the best Penguin of all time. 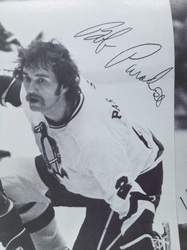 Kehoe played for the Pens from 1974 through 1984. 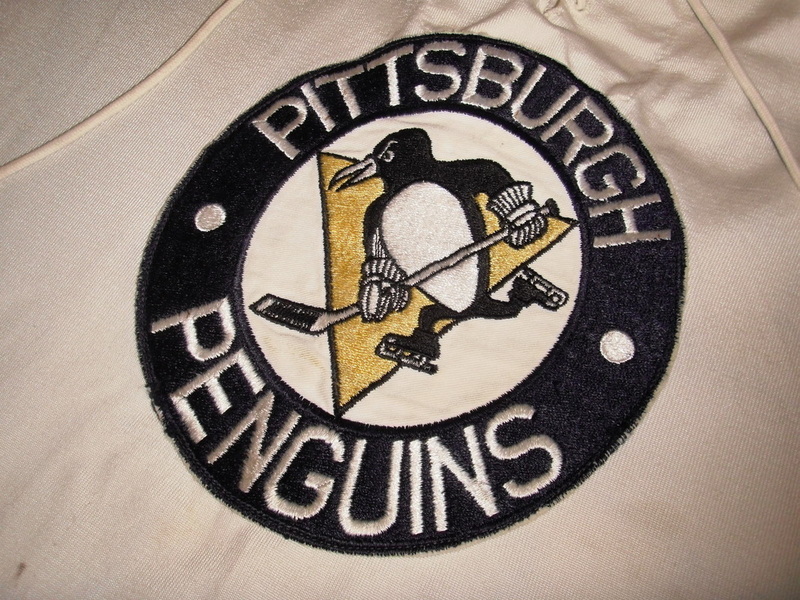 The Pens teams of that time were noted as a high scoring team, with players like Pierre Larouche, Jean Pronovost and Syl Apps. 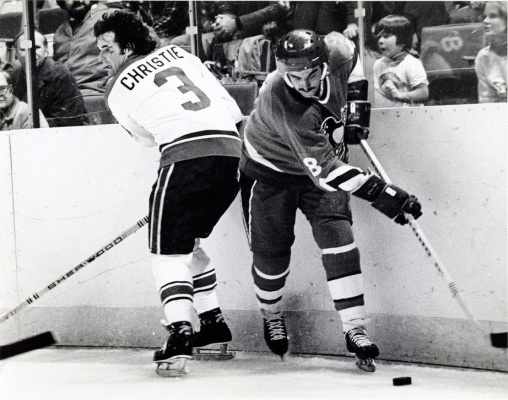 The speedster Kehoe fit right in as he was a consistent 30 goal threat, topping out at 55 in 1980-81, setting team record since bettered by none other than Mario Lemieux and Jaromir Jagr. 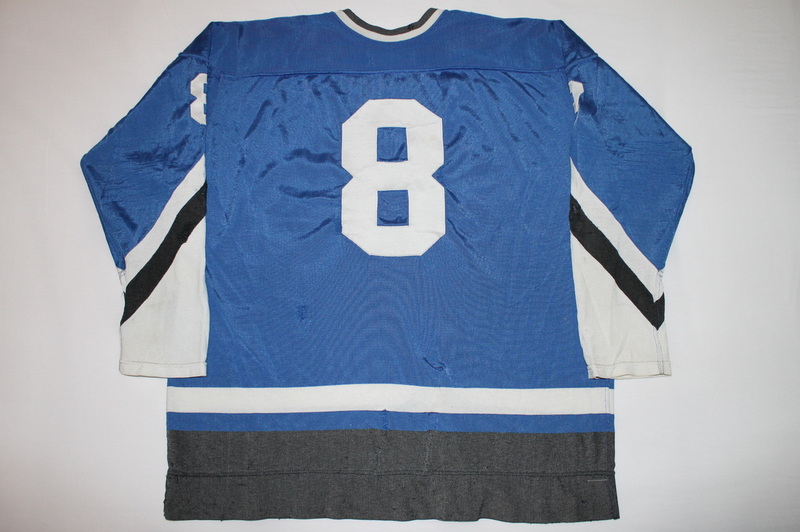 In his career Kehoe scored 371 goals and 767 points in 906 games in 14 seasons, including his first three seasons in Toronto. 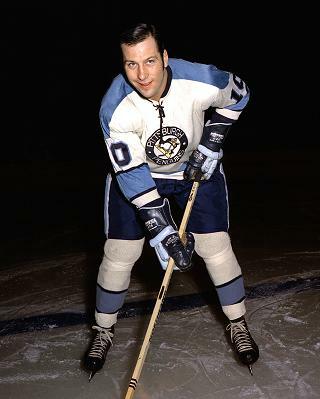 The two time all star game representative was once the Penguins leading scorer in franchise history. 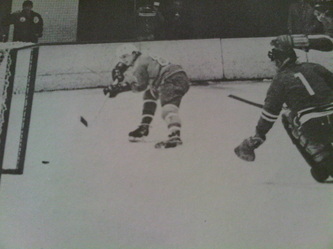 Kehoe was a shoot-first type of player, blessed with a laser of a shot. 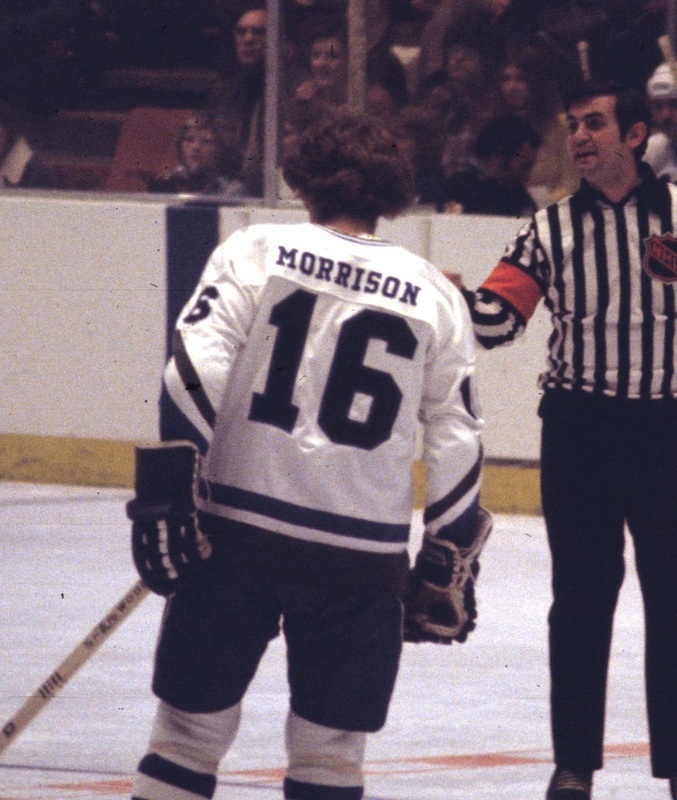 He was also an incredibly clean player, picking up only 120 career penalty minutes. 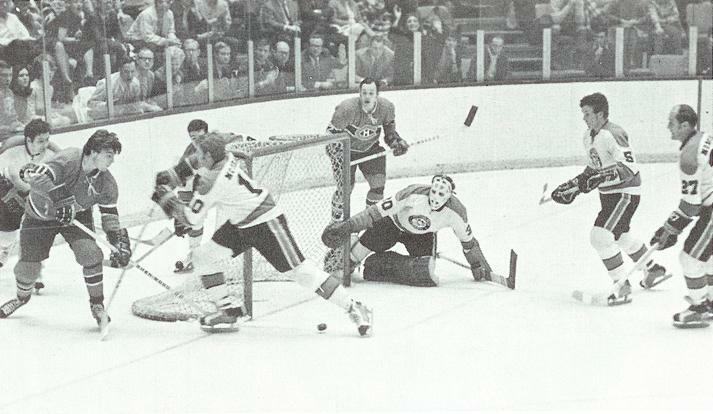 In the season where he scored 55 goals he only had 6 minutes in penalties, making him the obvious choice as the Lady Byng trophy winner. 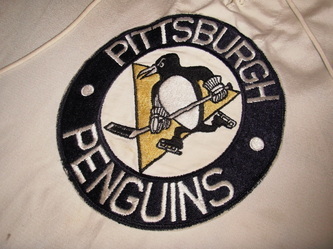 Unfortunately for Kehoe, his Pittsburgh Penguins teams enjoyed very little team success. When they qualified for the playoffs, they were normally dismissed in the first round, and they certainly were never feared as a Stanley Cup contender. 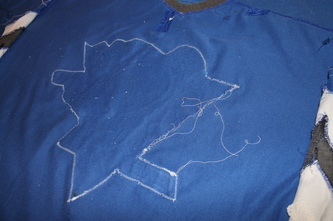 The team was weak defensively. 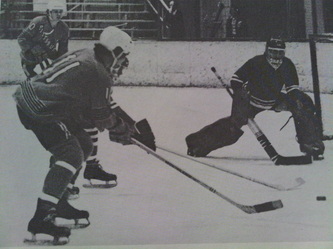 Many of the players including Kehoe were not exactly known for their defensive expertise. It is too bad that poor team success can make the career of a good player like Kehoe almost completely forgotten. 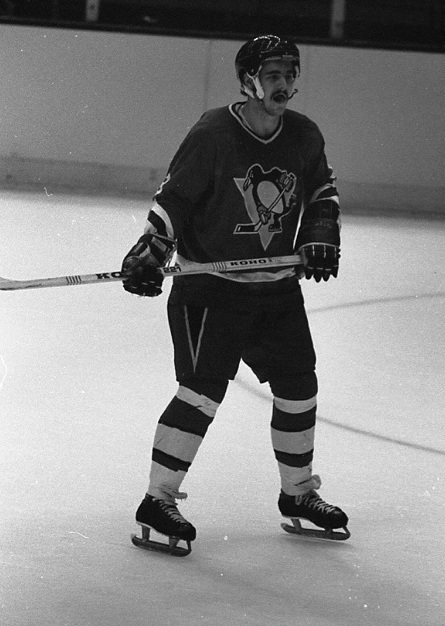 Kehoe would be Mario Lemieux's first right winger upon 66's arrival in Pittsburgh in 1984-85, but the tandem was short lived. 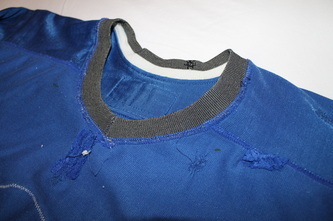 Late in the previous season Kehoe suffered a pinched nerve in his neck that caused chronic numbness in his right side. 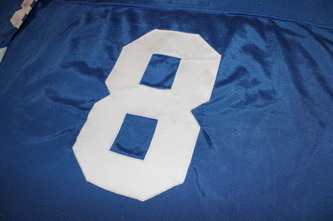 He would never fully recover, ultimately retiring in November of 1984, after trying to keep playing in just 6 games.